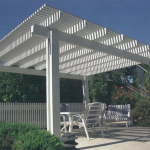 If you are looking for shade, you have come to the right place. 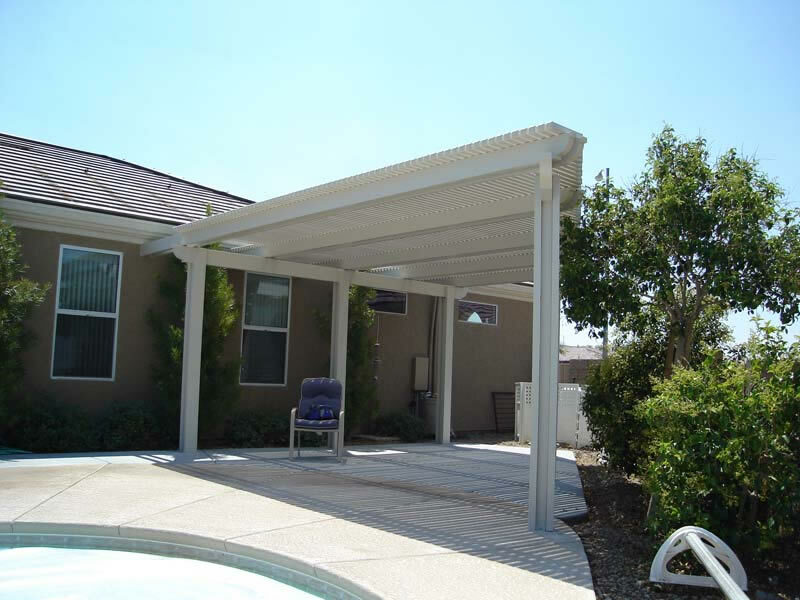 We offer a broad range of patio covers from our least expensive standard aluminum patio cover to our more elaborate Ultimate Insulated cover and a lot of options between. 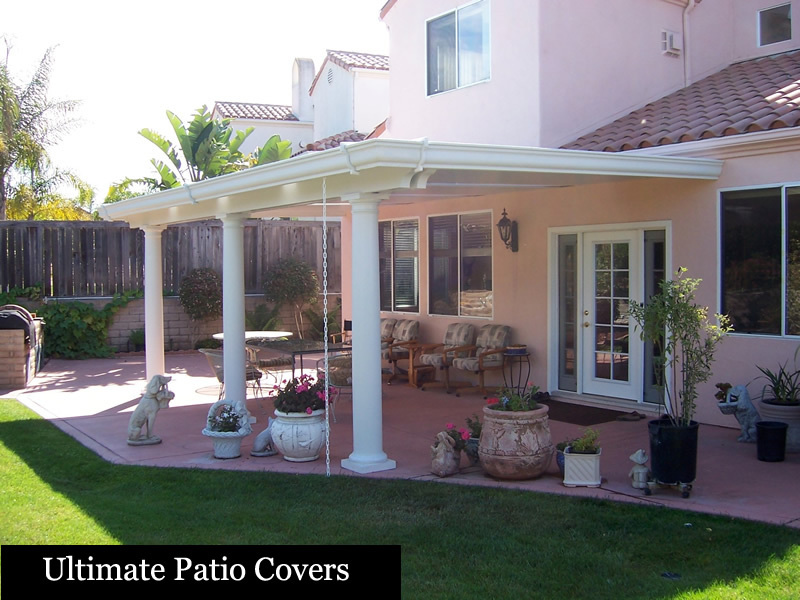 We can customize any of these covers to suit your needs. 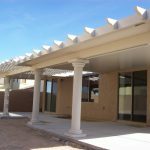 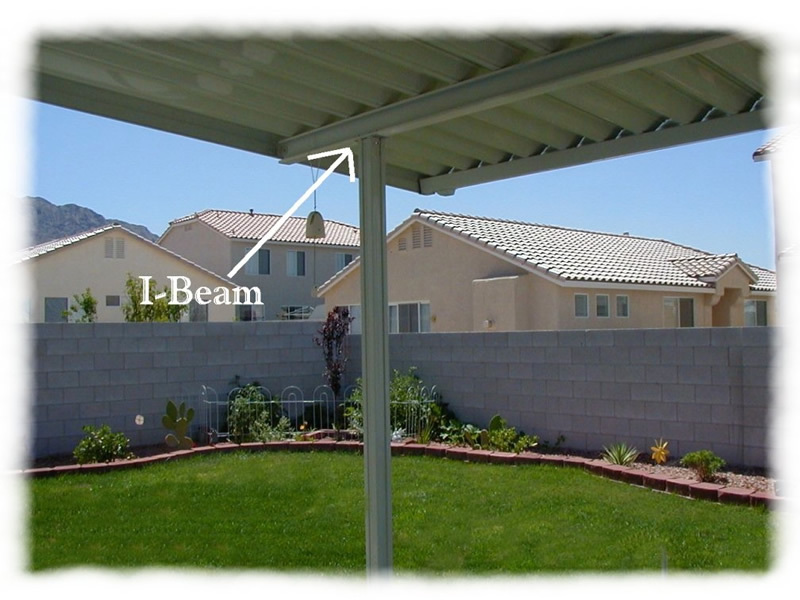 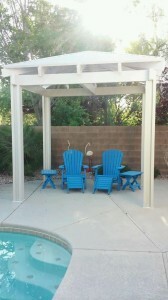 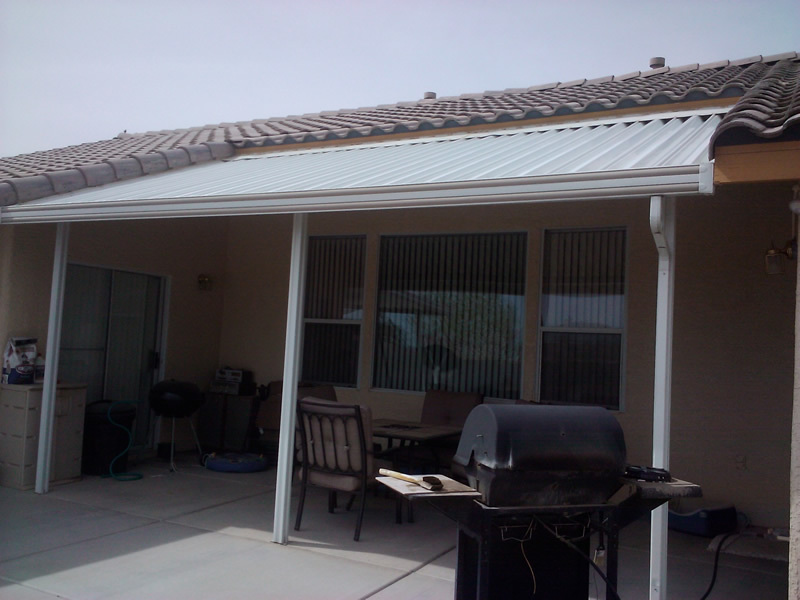 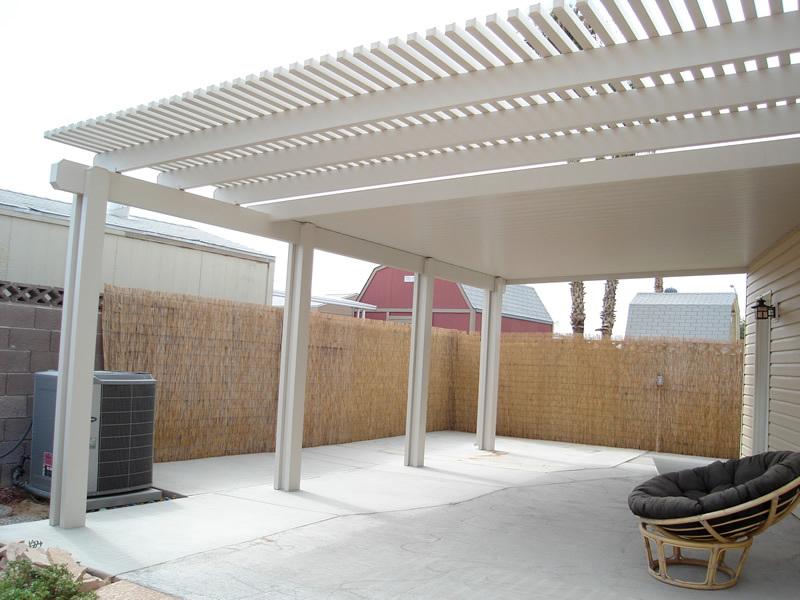 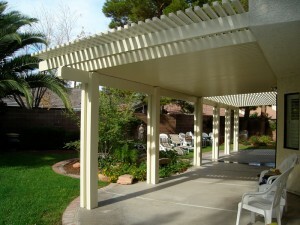 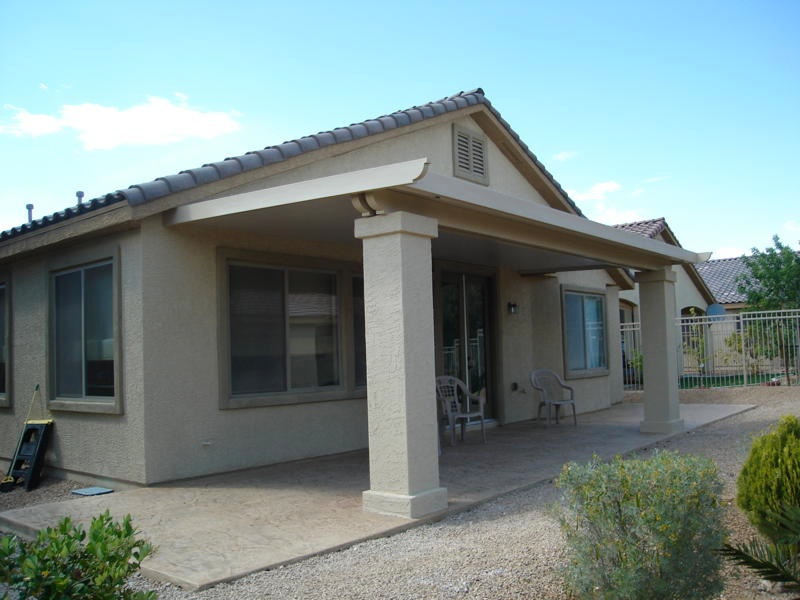 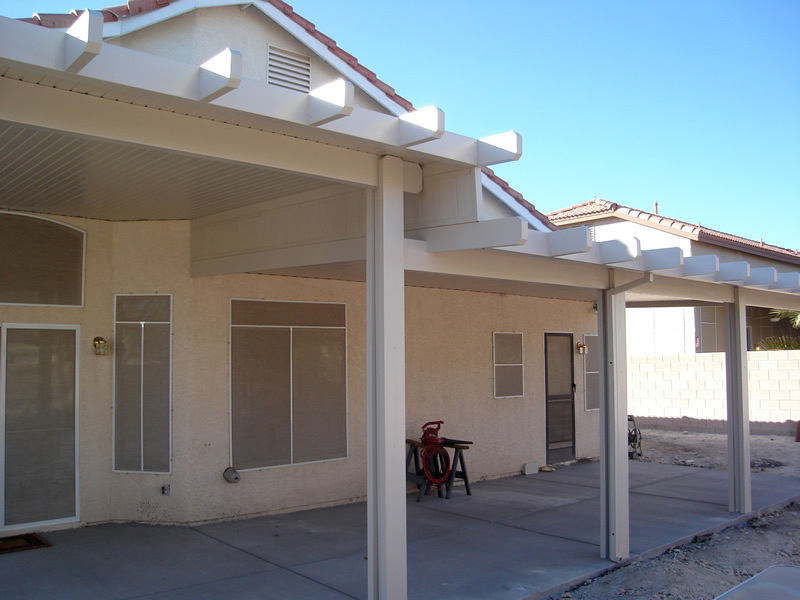 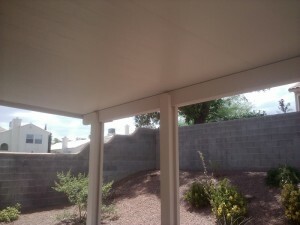 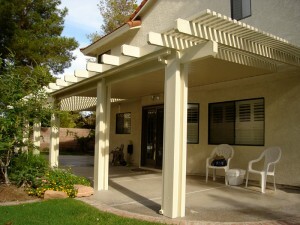 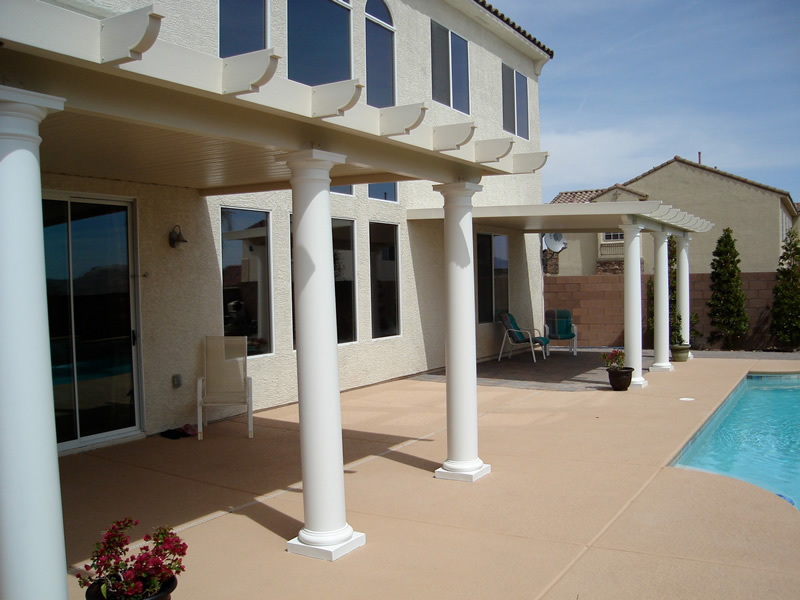 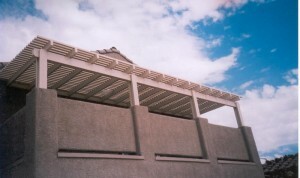 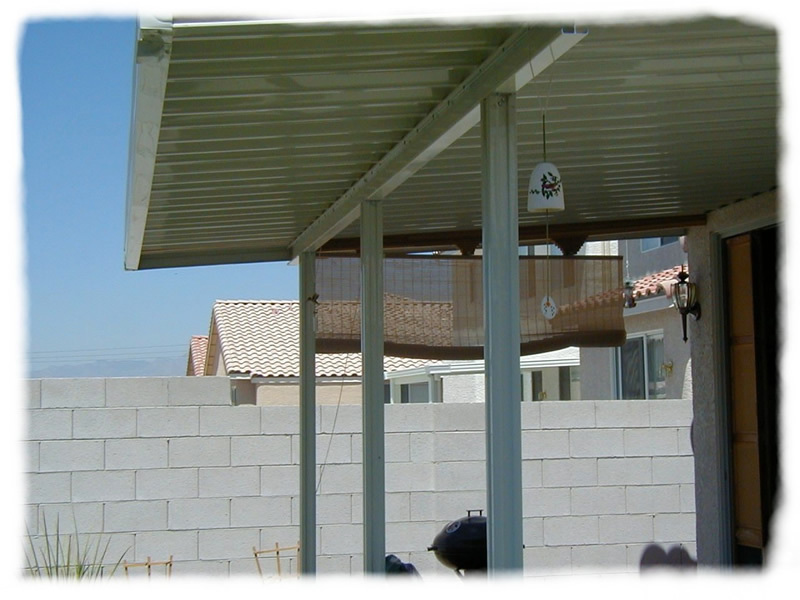 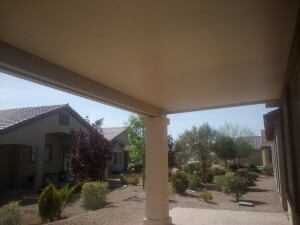 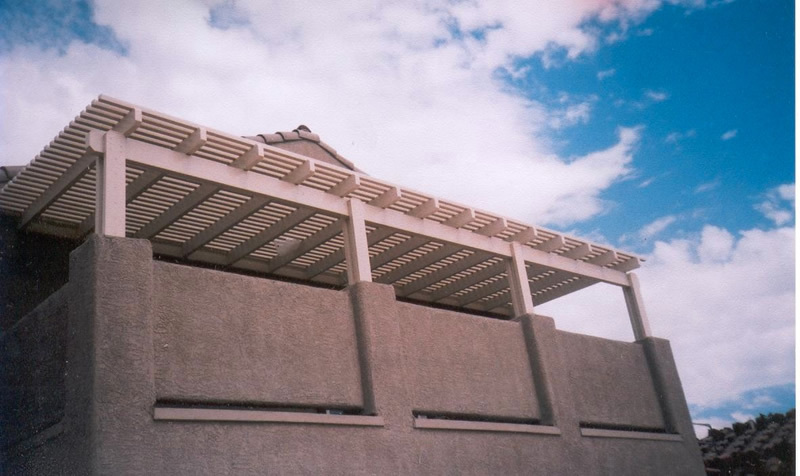 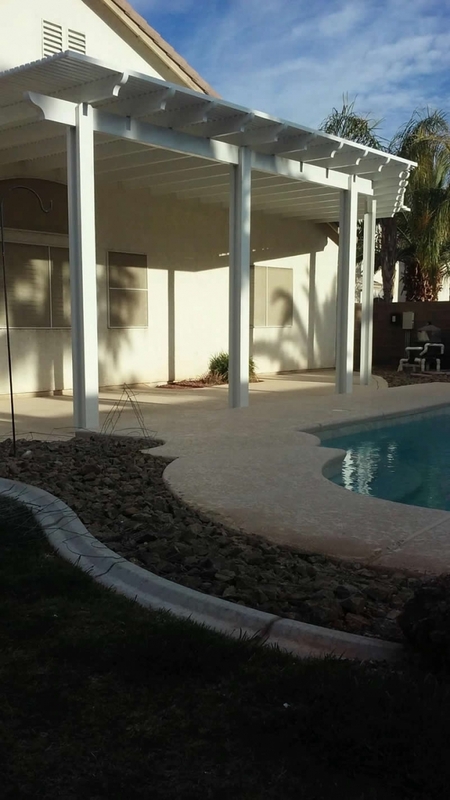 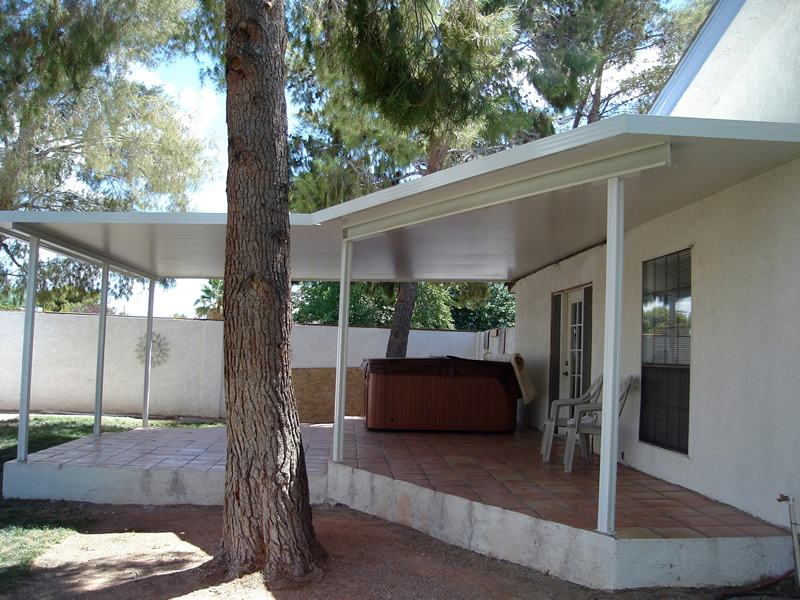 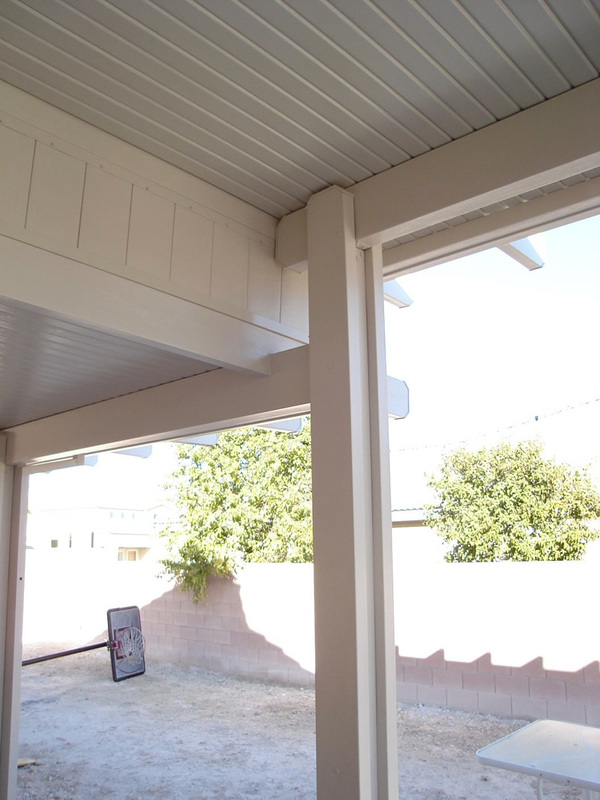 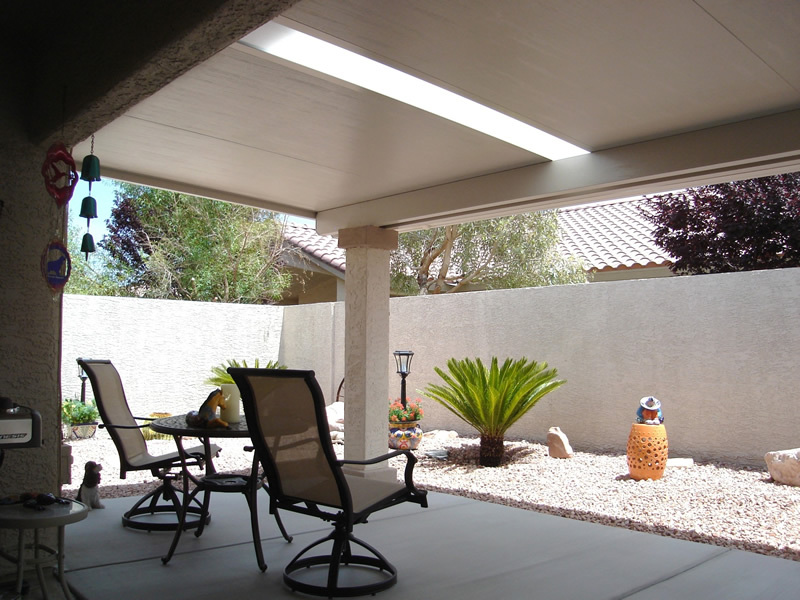 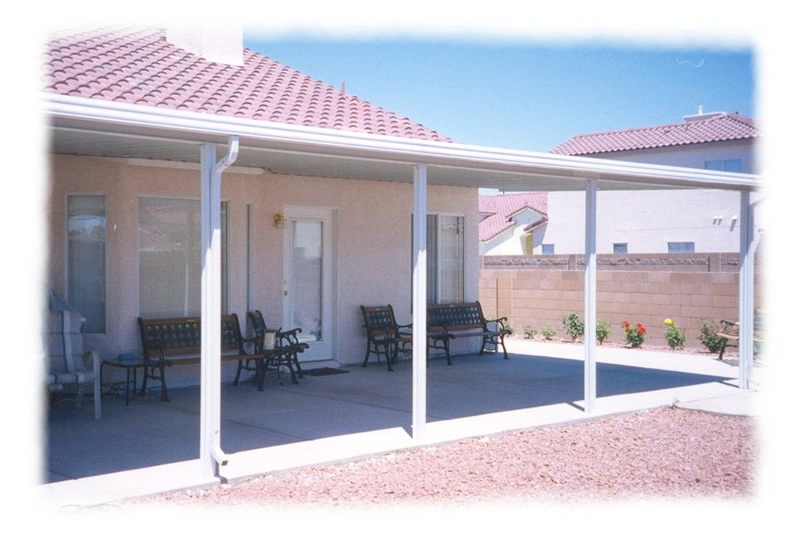 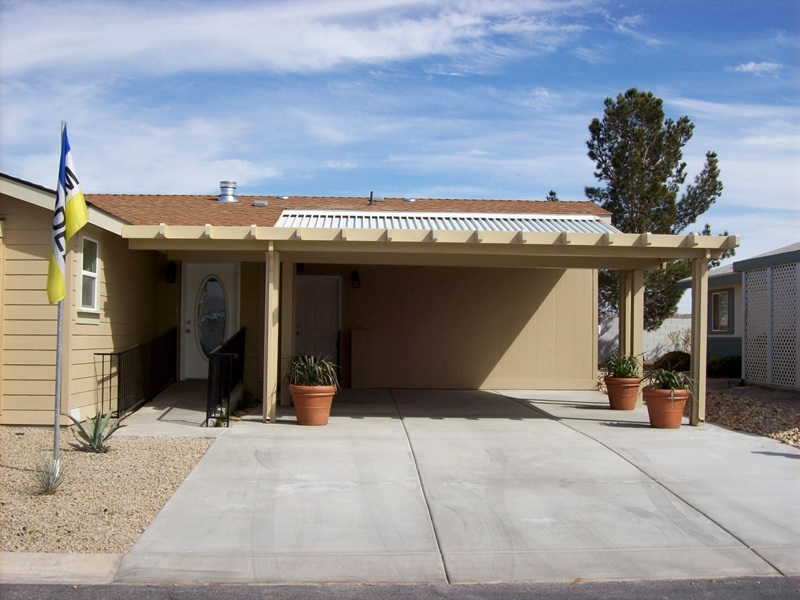 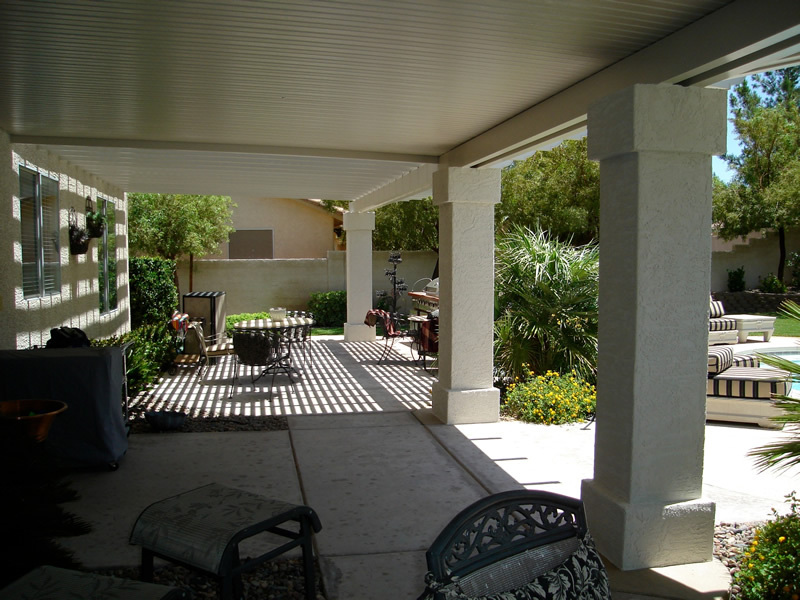 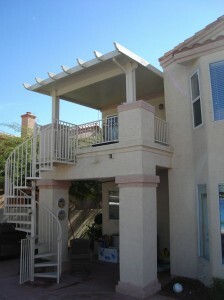 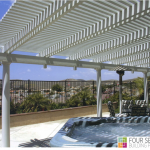 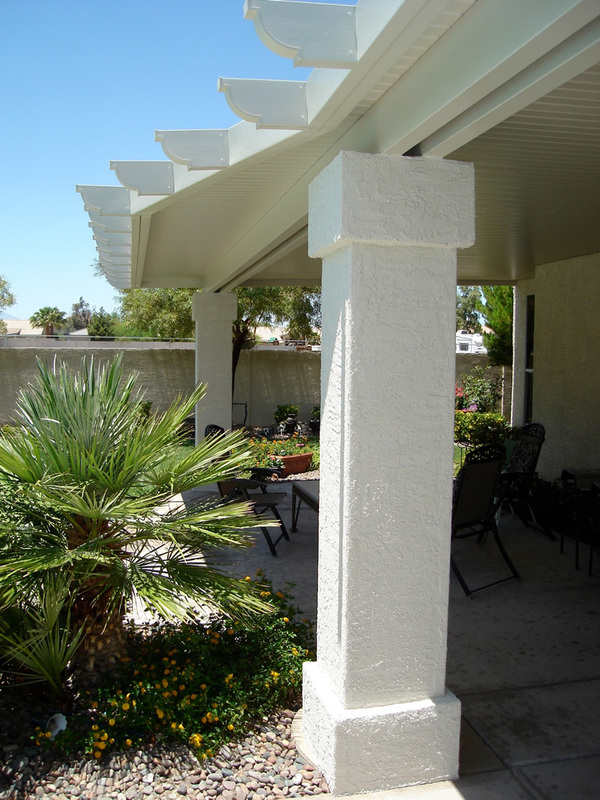 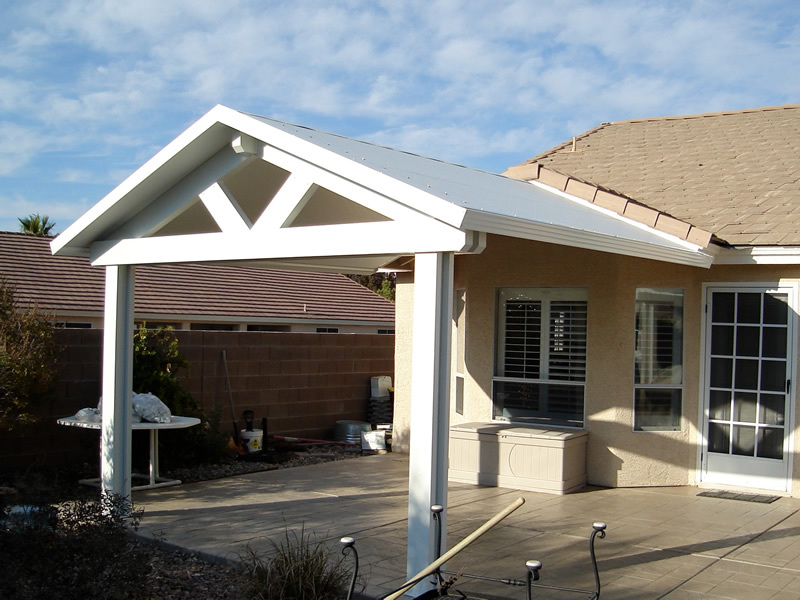 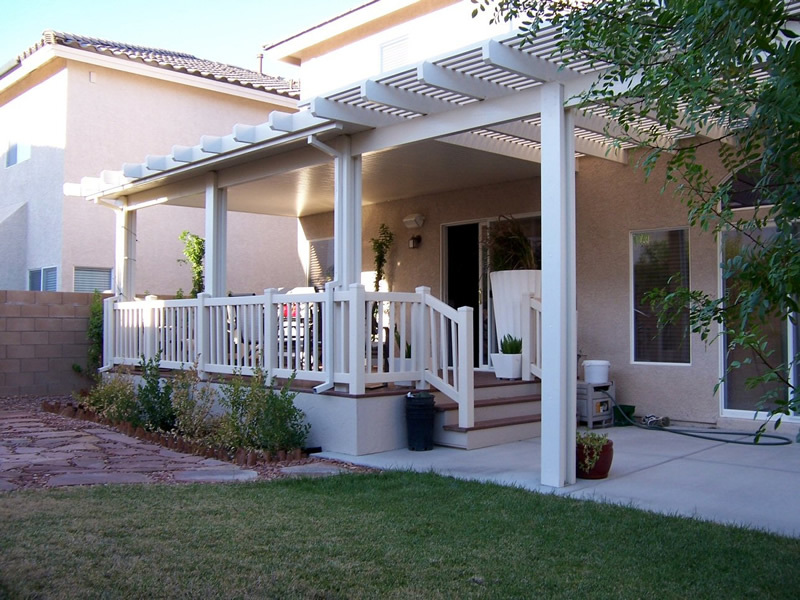 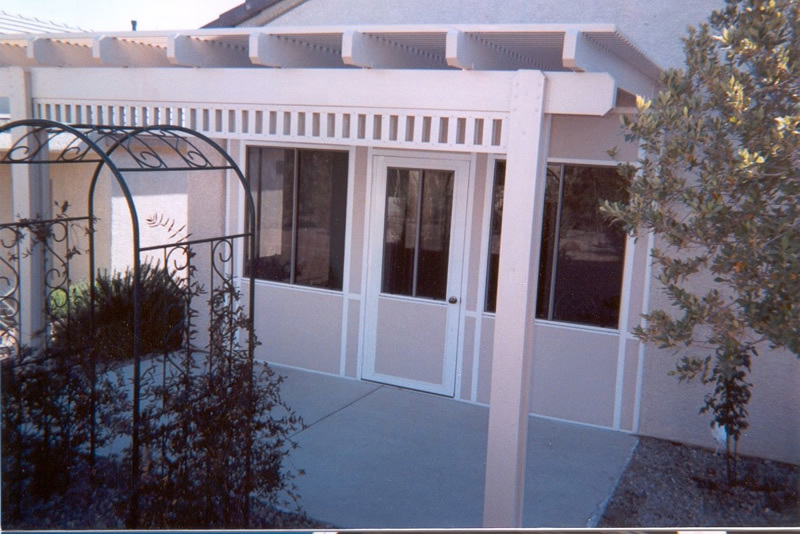 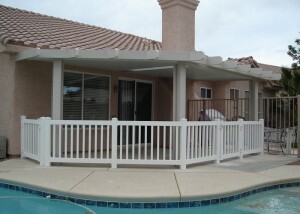 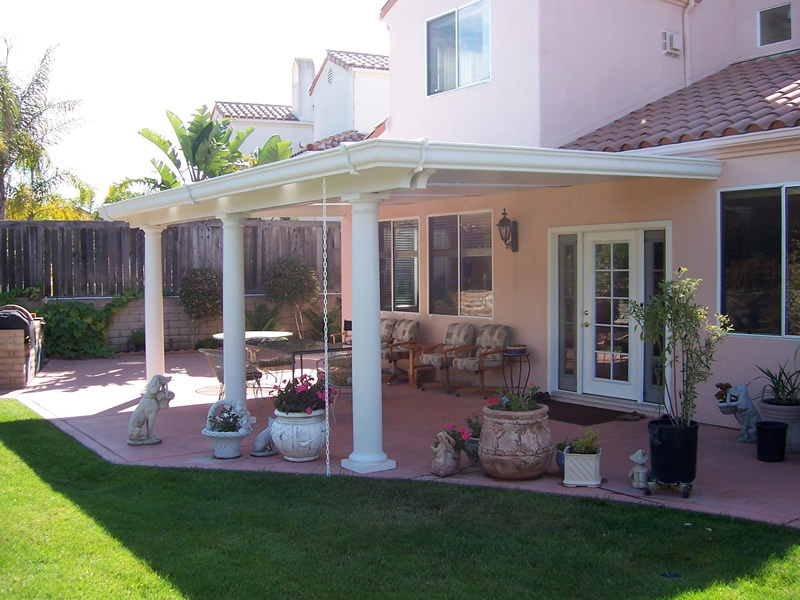 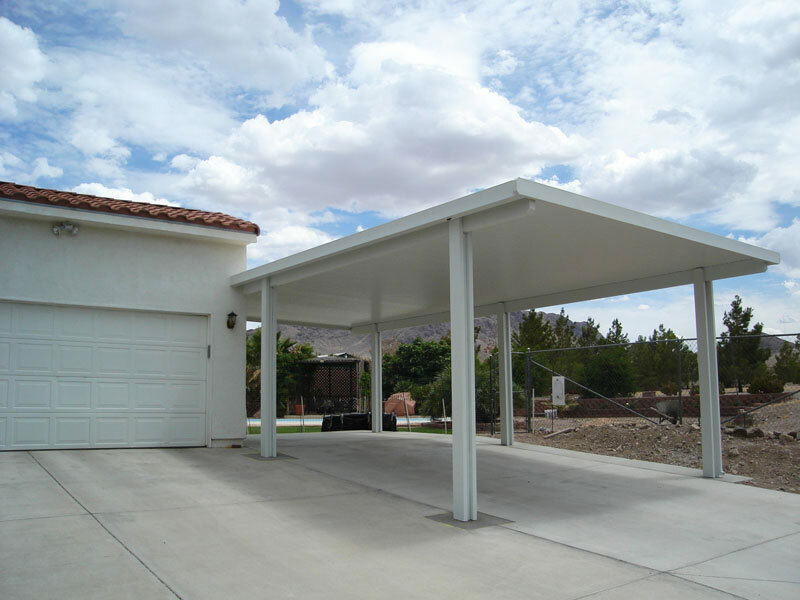 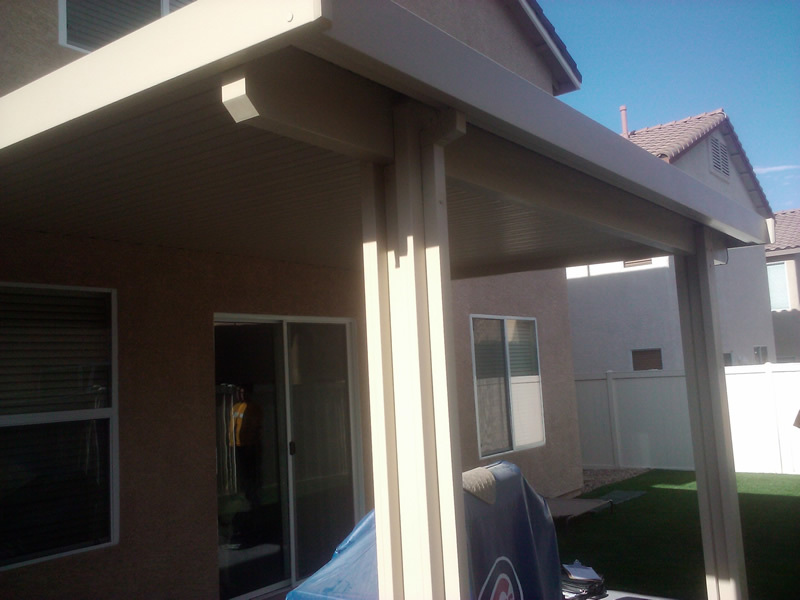 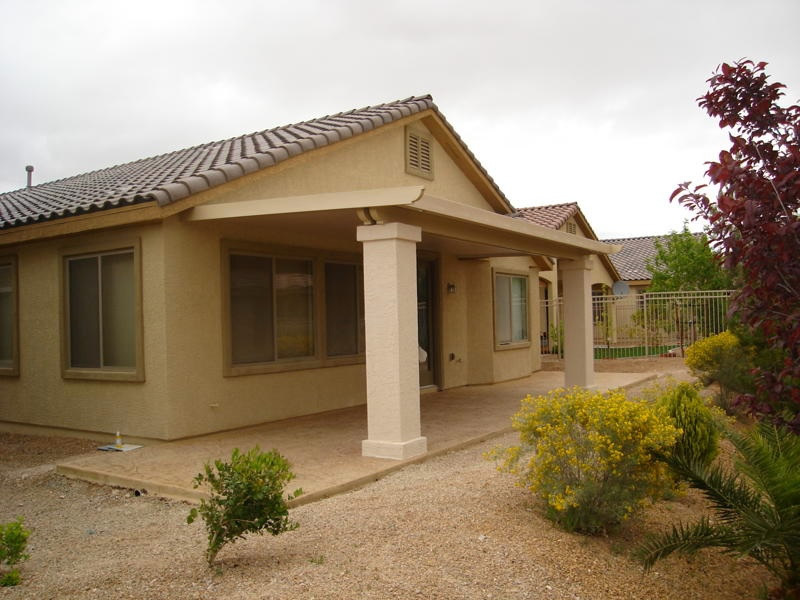 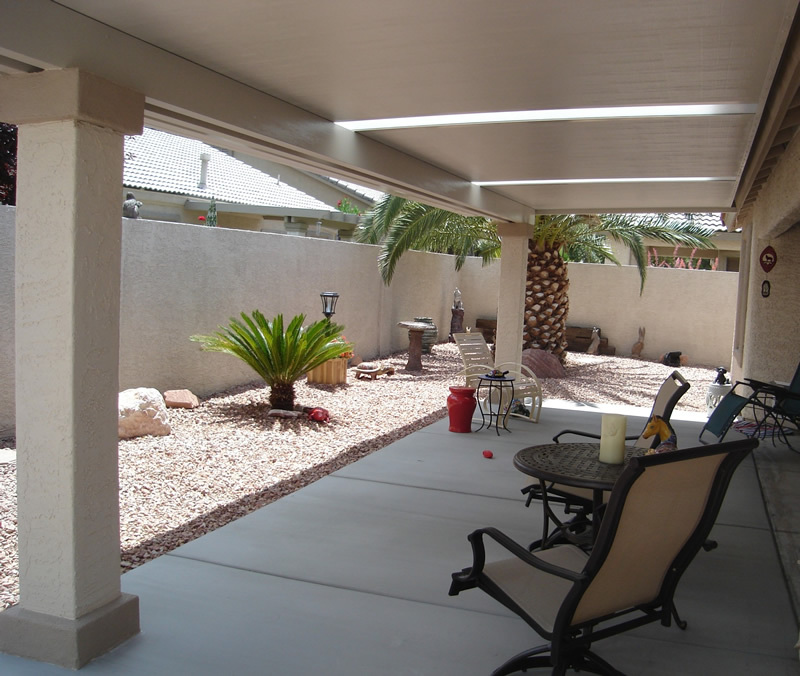 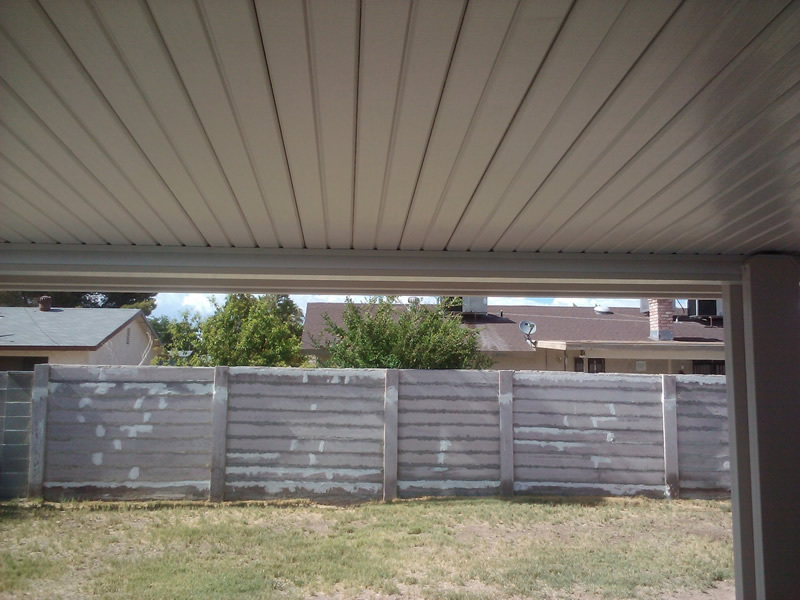 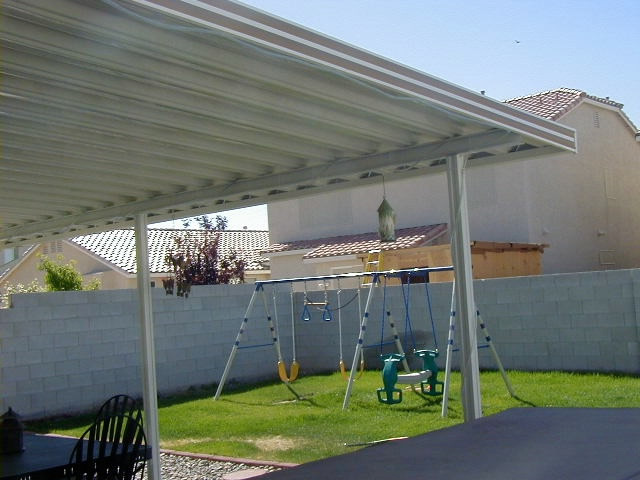 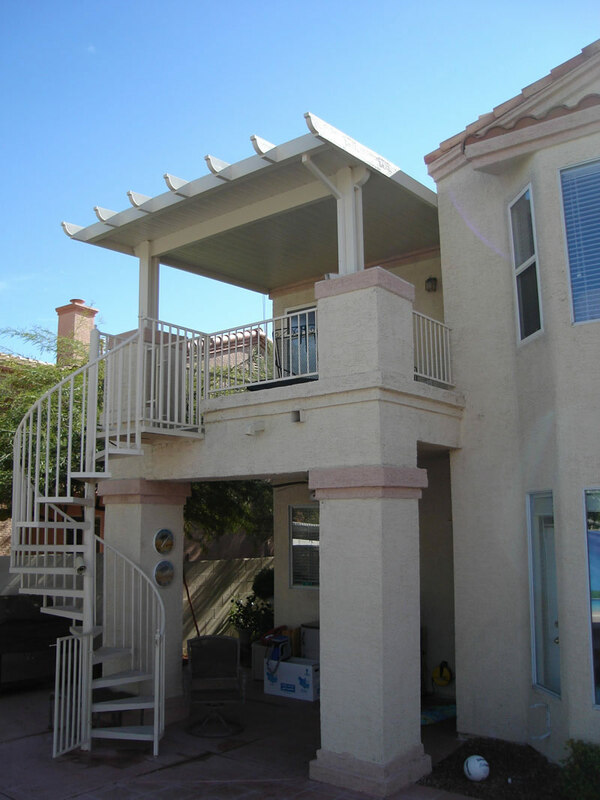 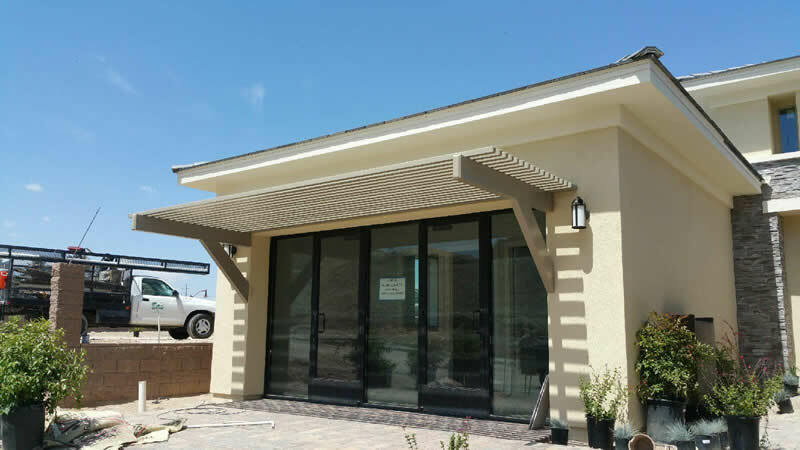 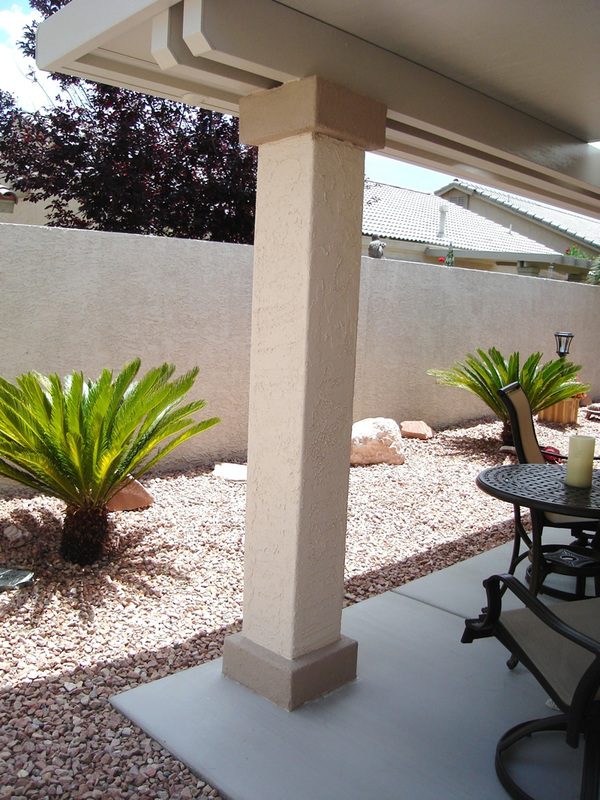 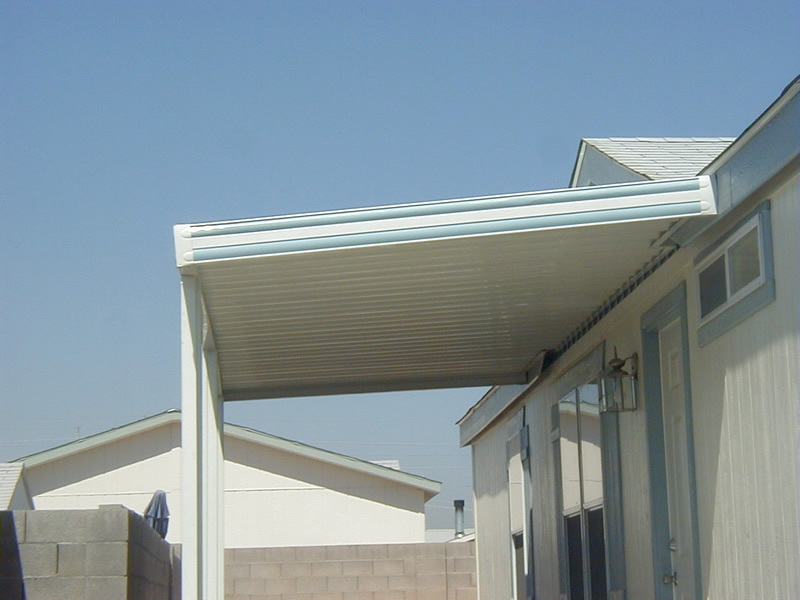 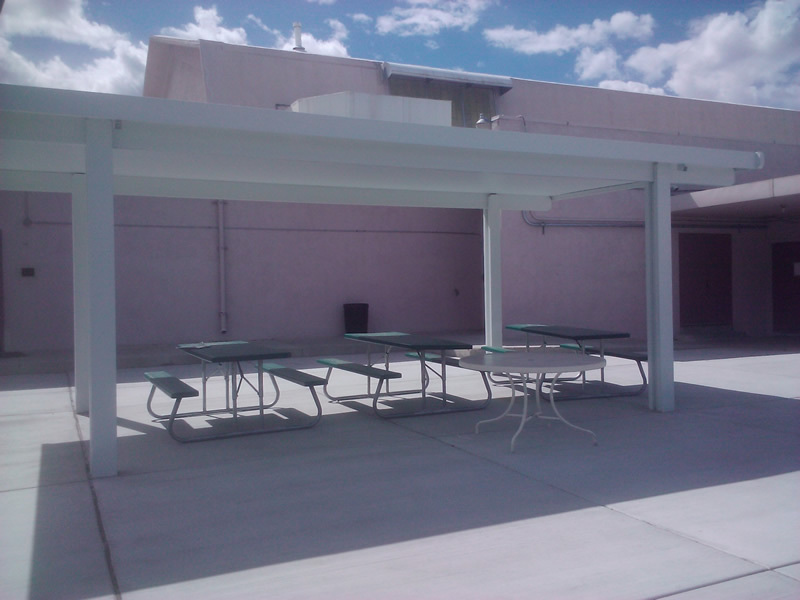 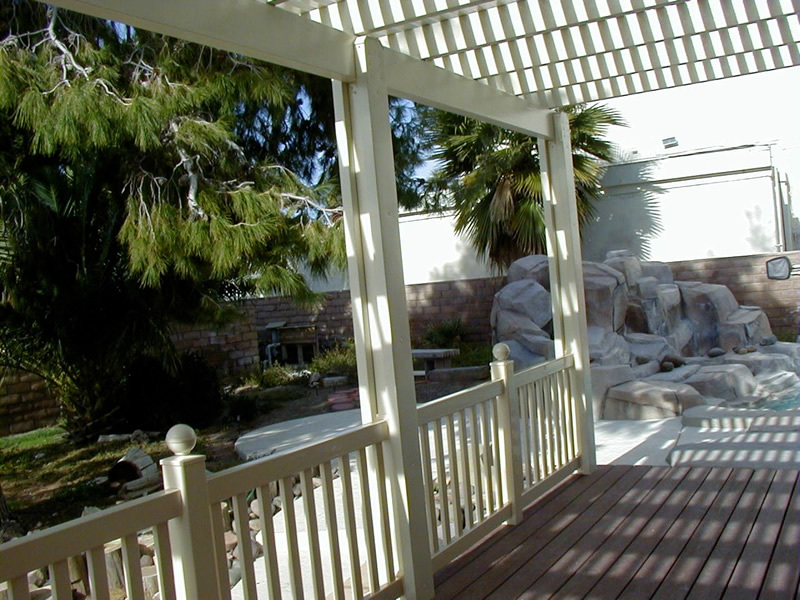 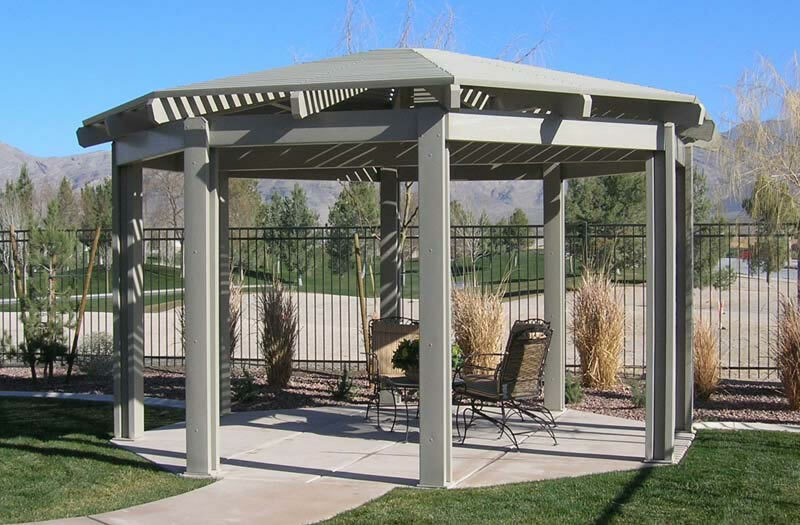 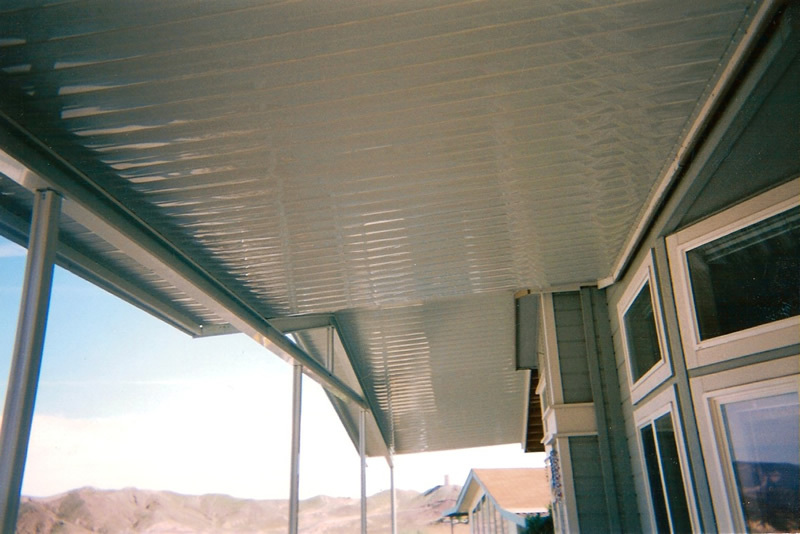 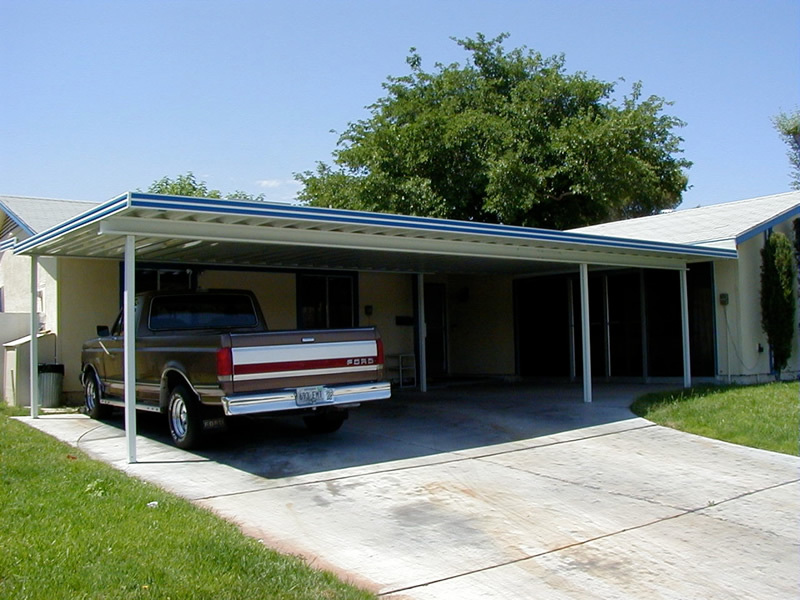 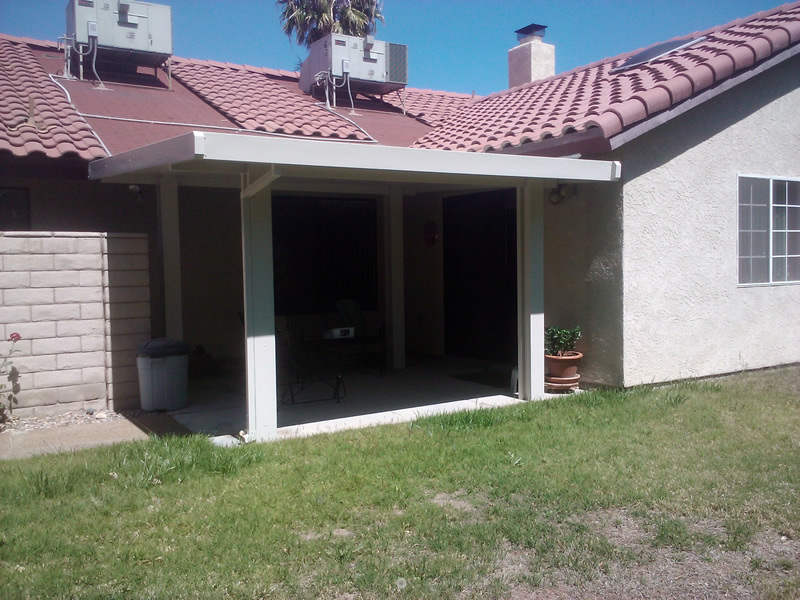 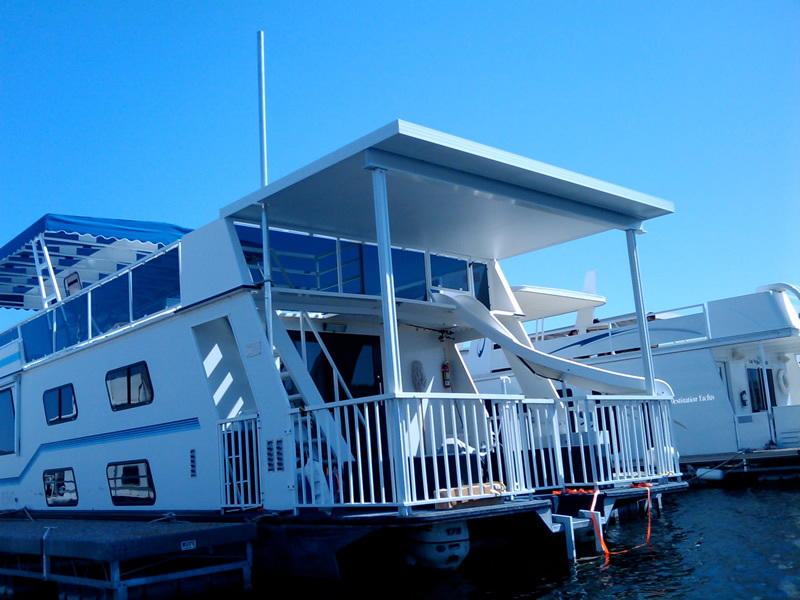 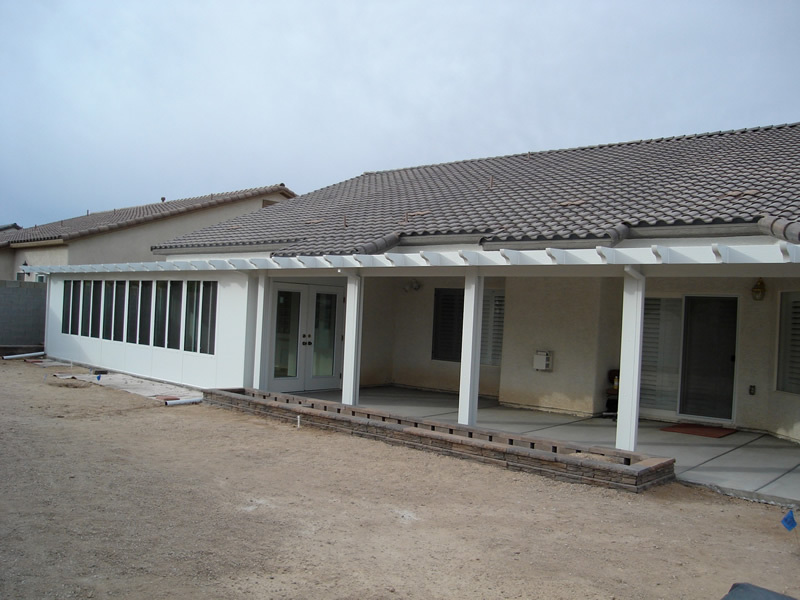 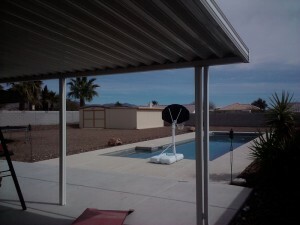 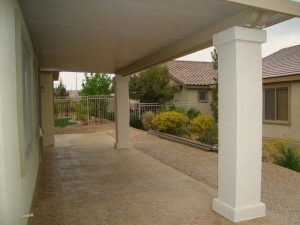 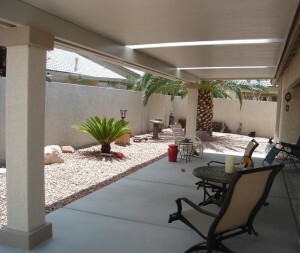 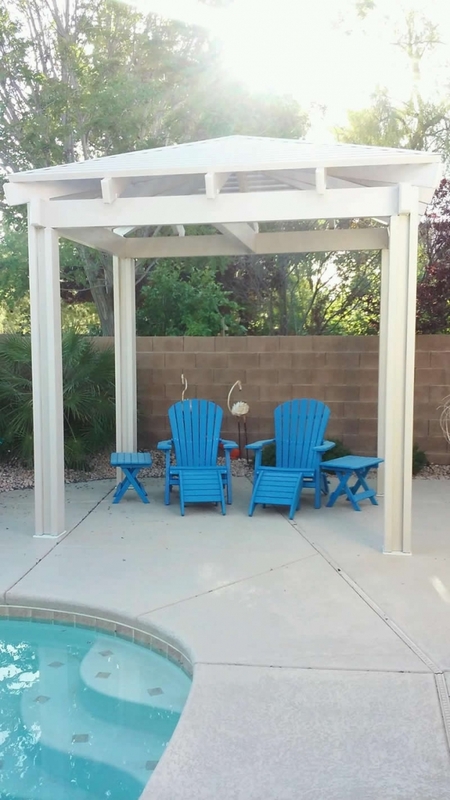 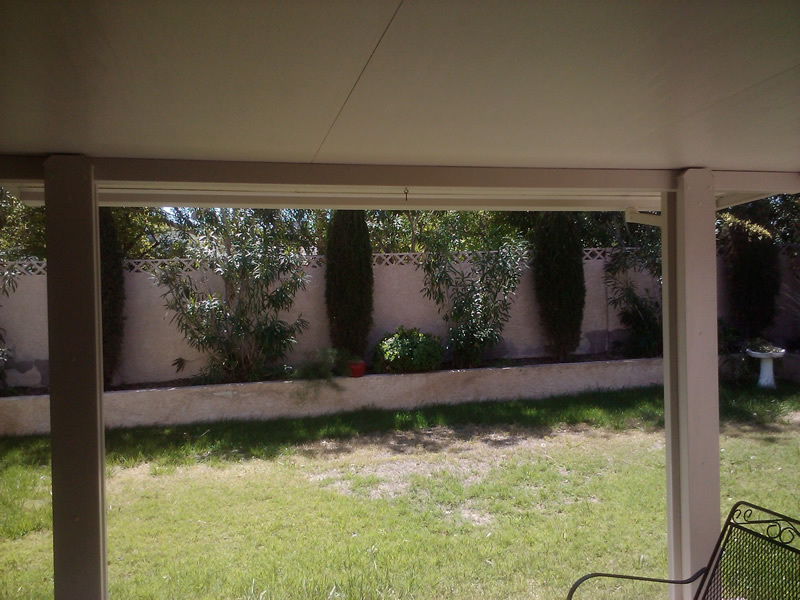 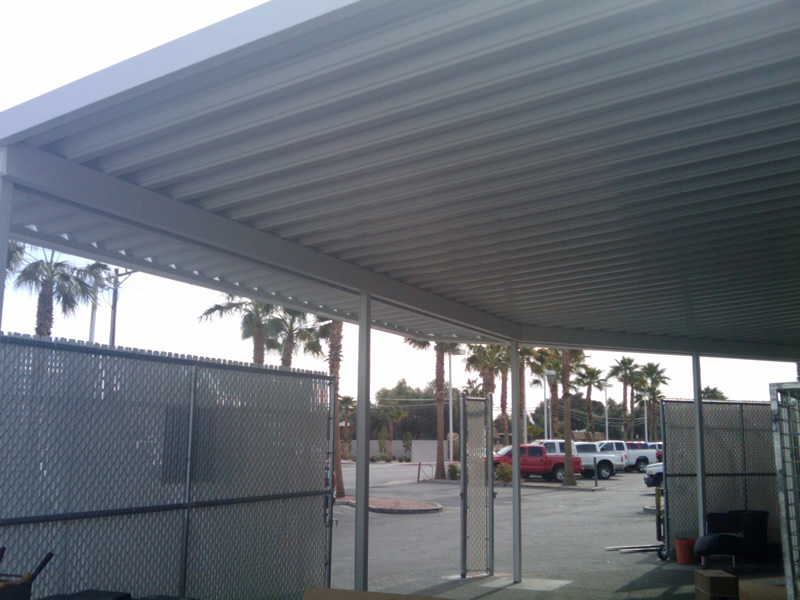 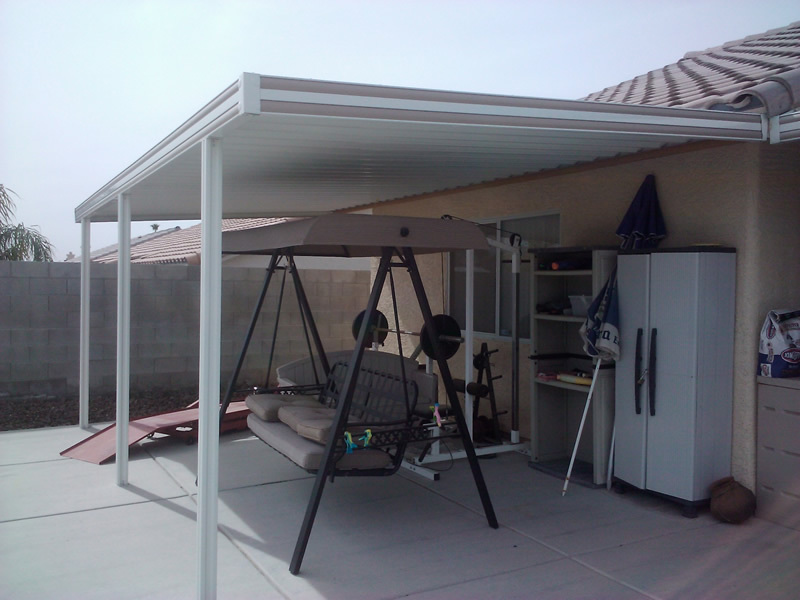 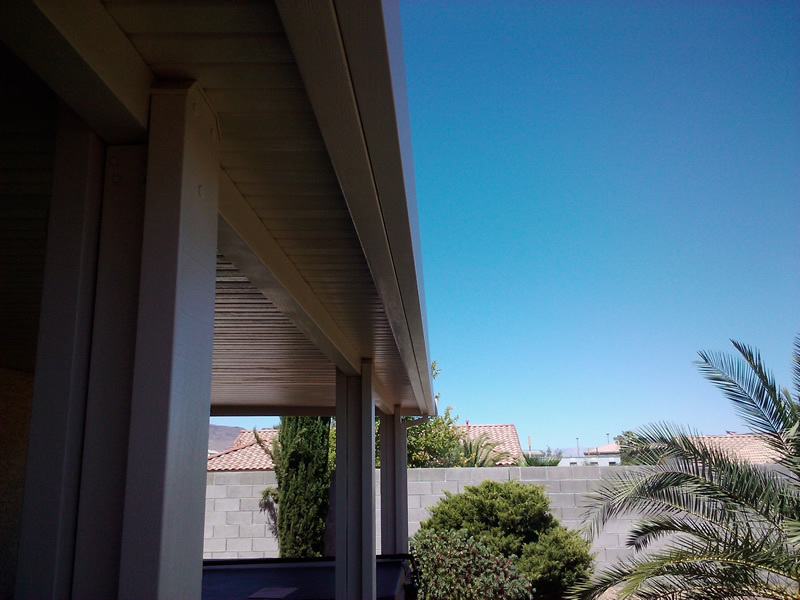 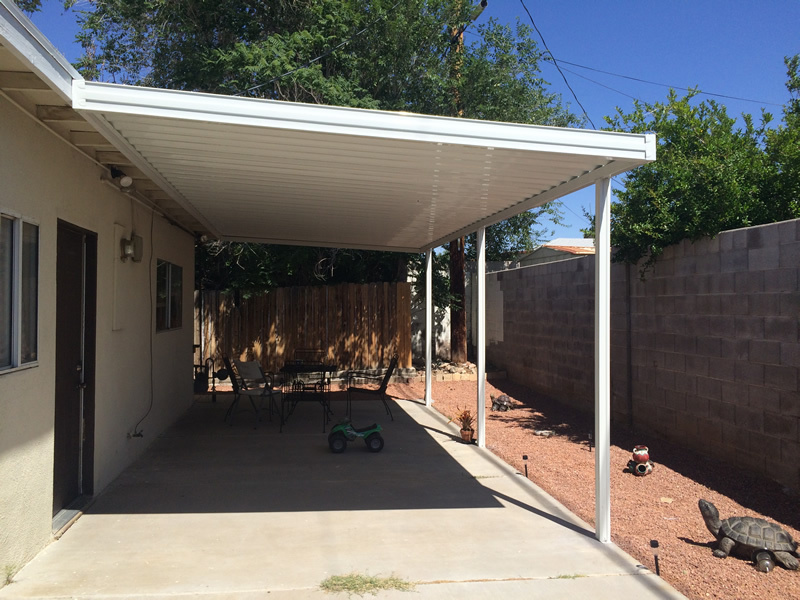 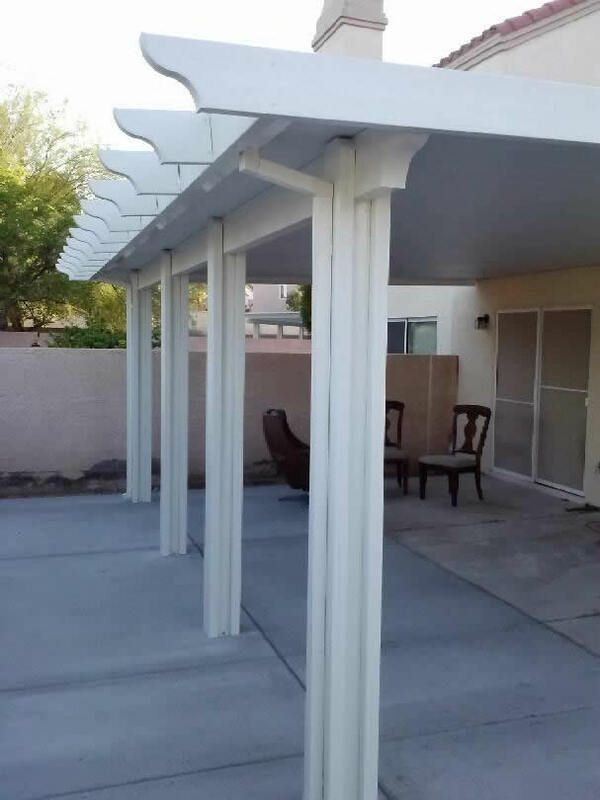 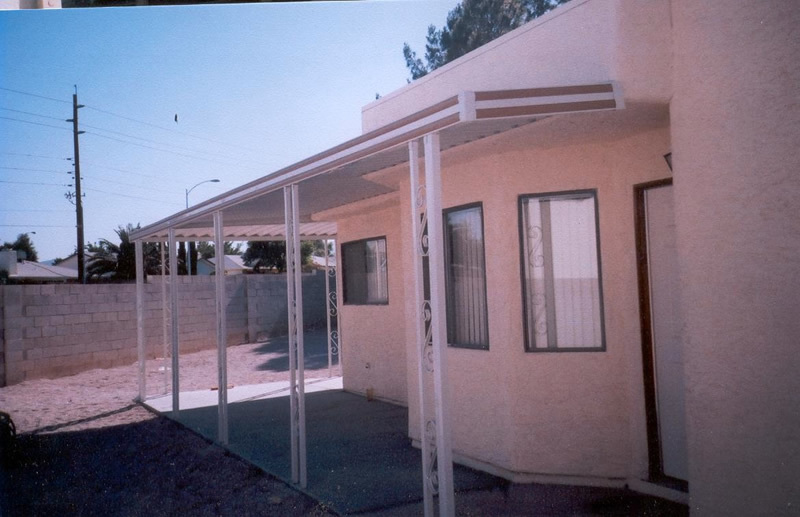 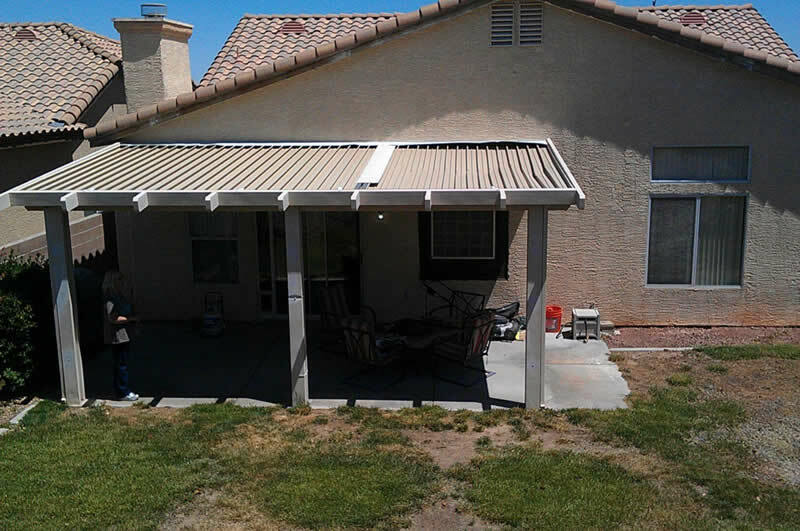 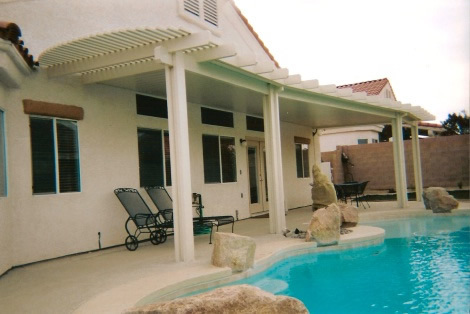 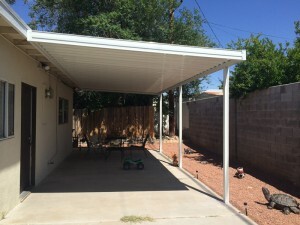 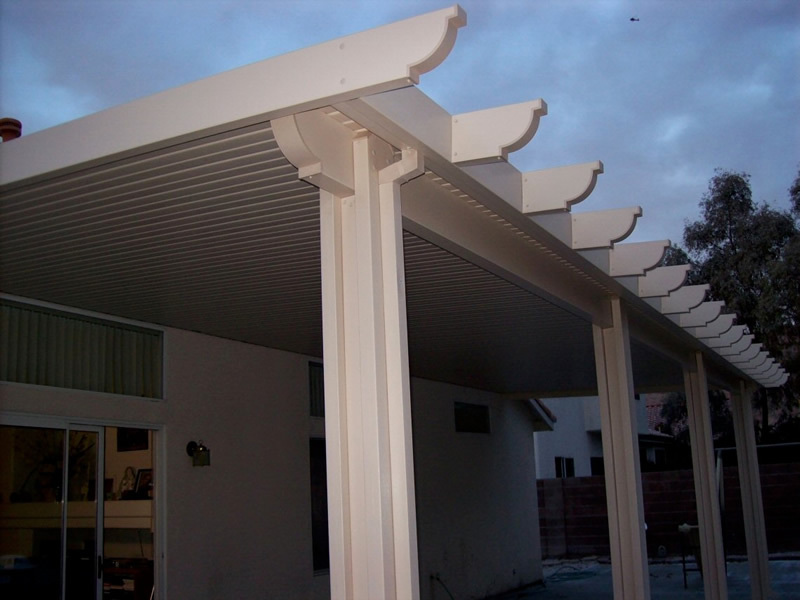 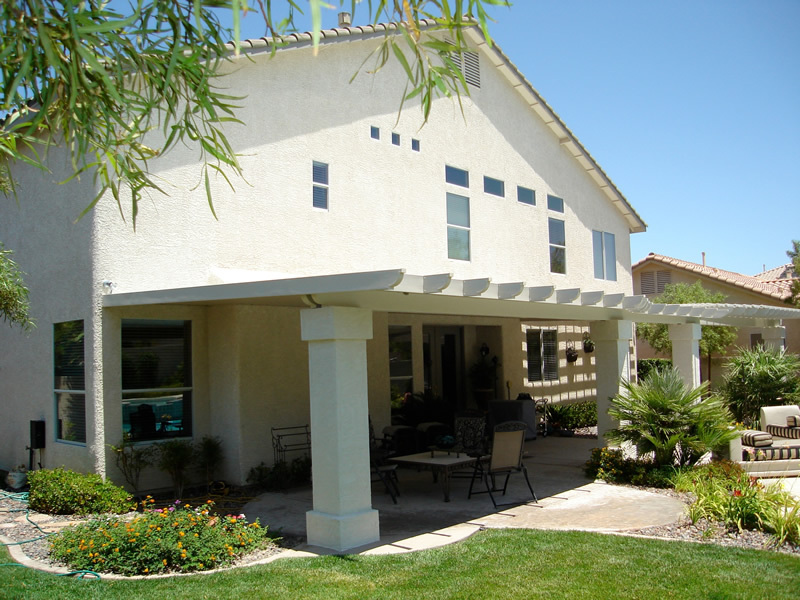 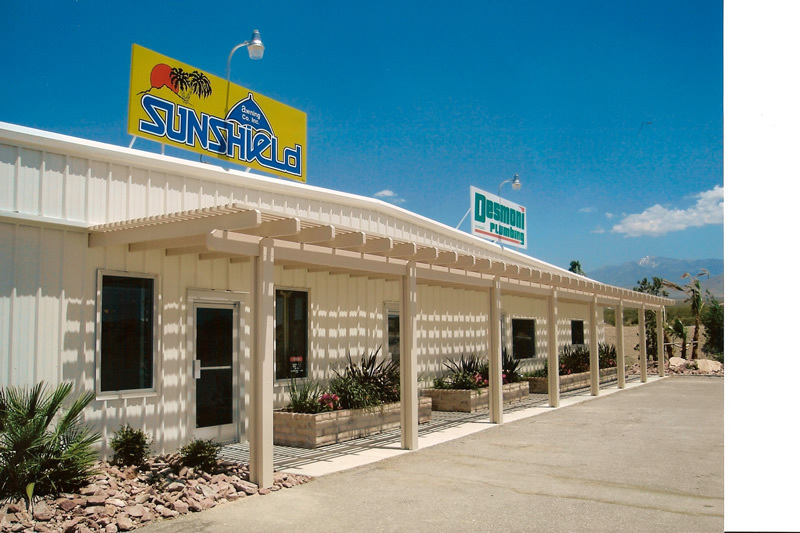 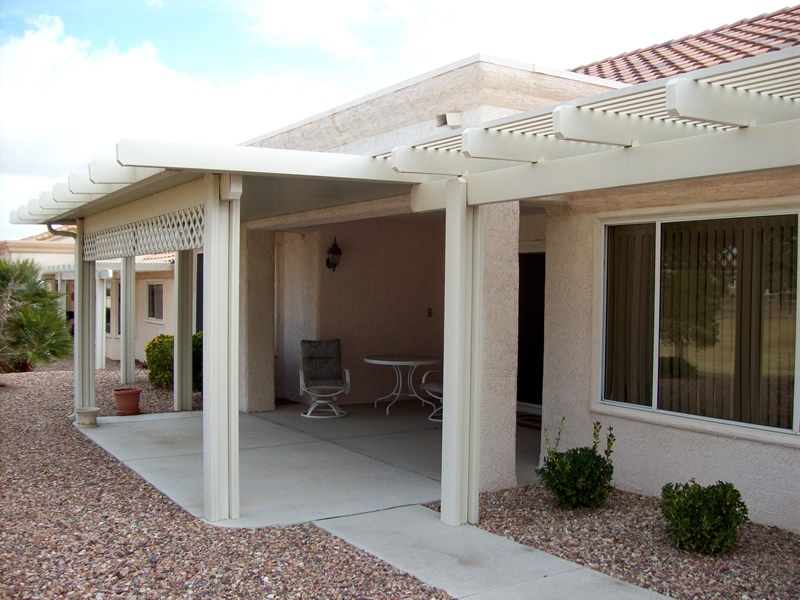 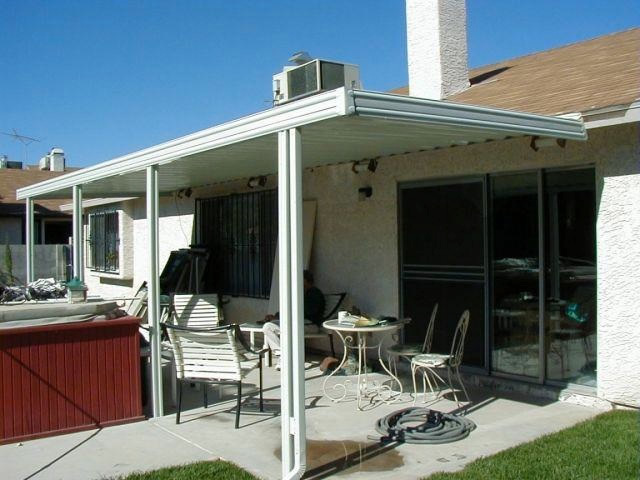 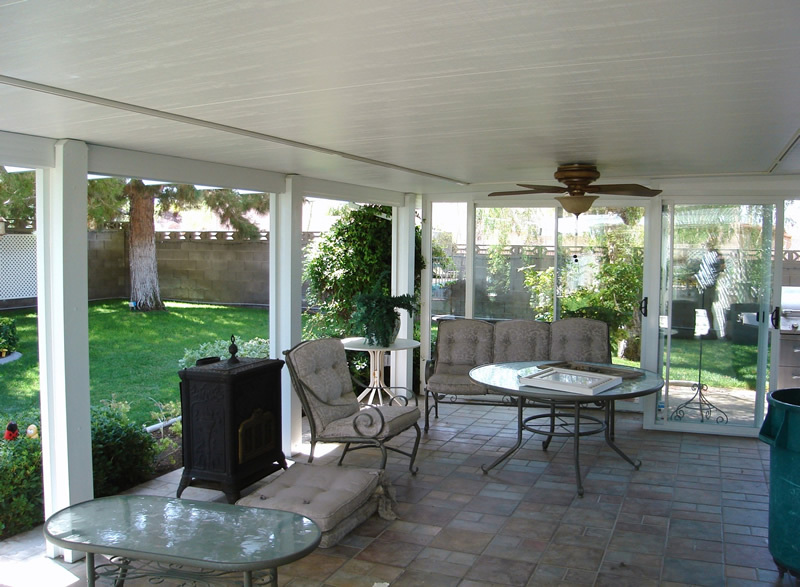 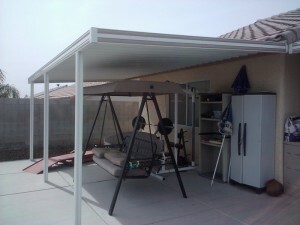 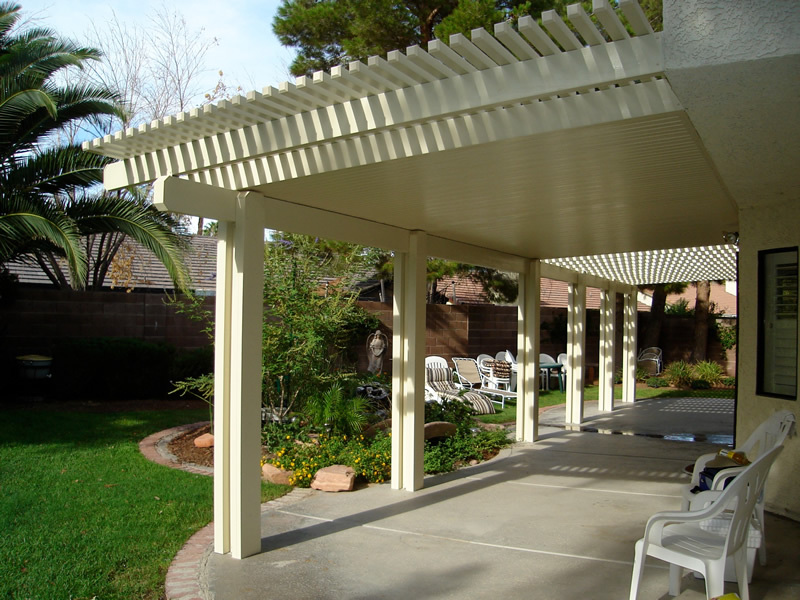 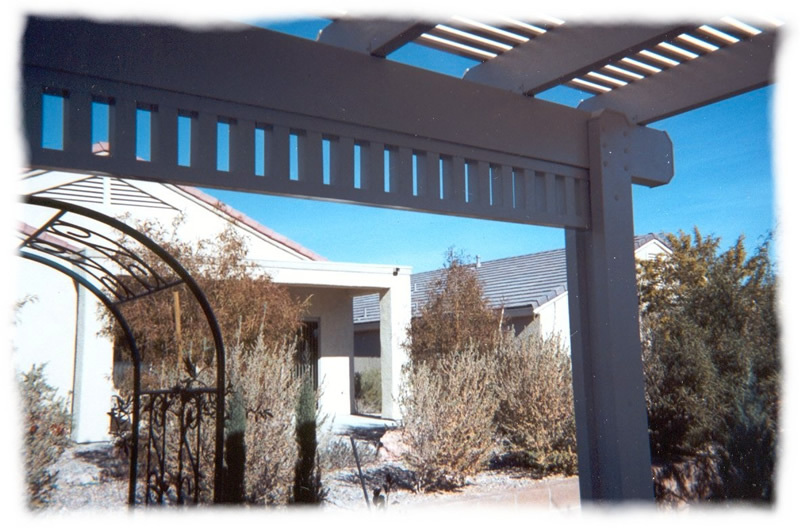 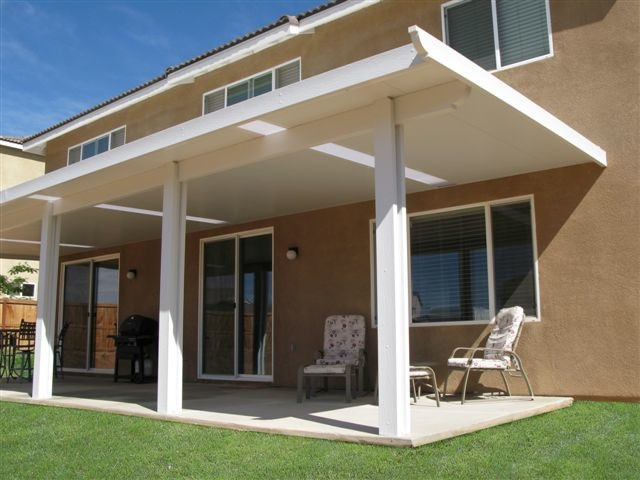 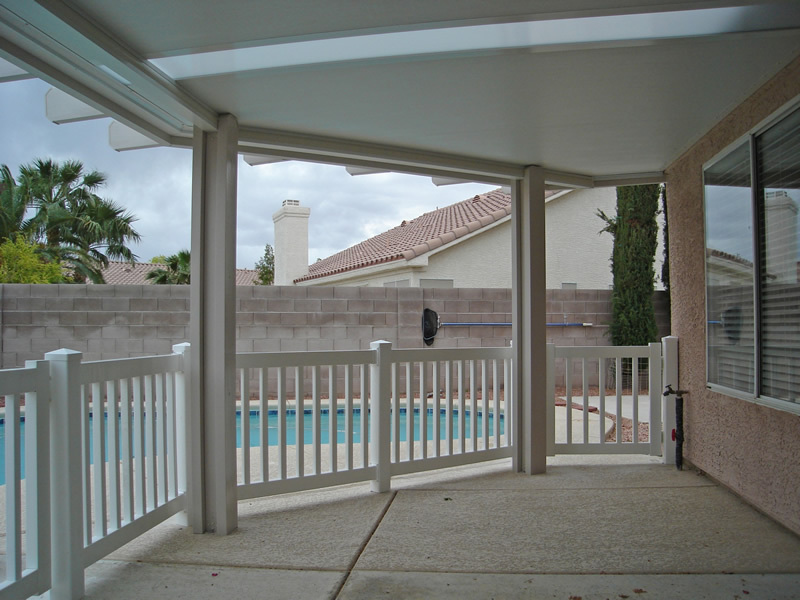 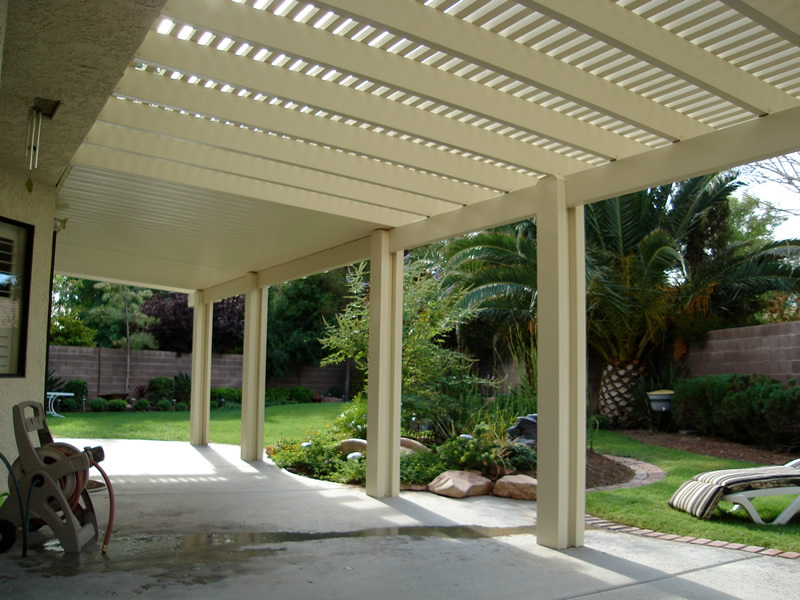 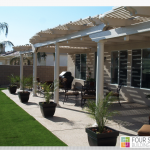 Located in the Patio Cover capital, Las Vegas, Nevada for over 43 years we have provided and installed patio covers in the Southern Nevada area. 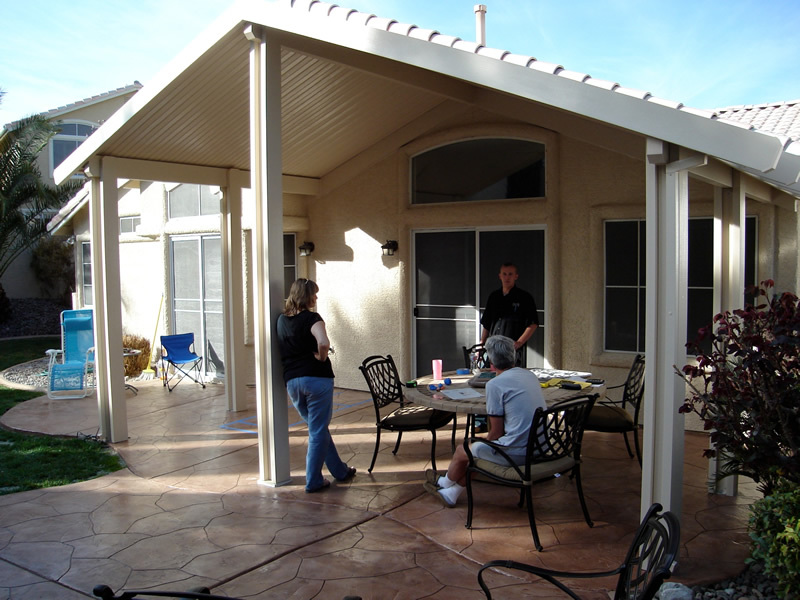 With our experienced staff, we can help you get the right patio cover, and walk you through the installation if you prefer to do it yourself. Please check out our reviews on Angies List and Yelp. 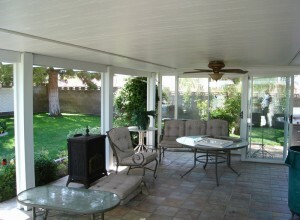 Let us help you add more available space and increase the value of your home! 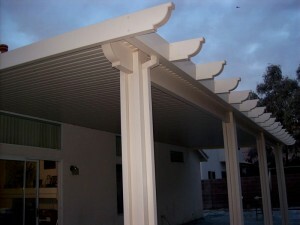 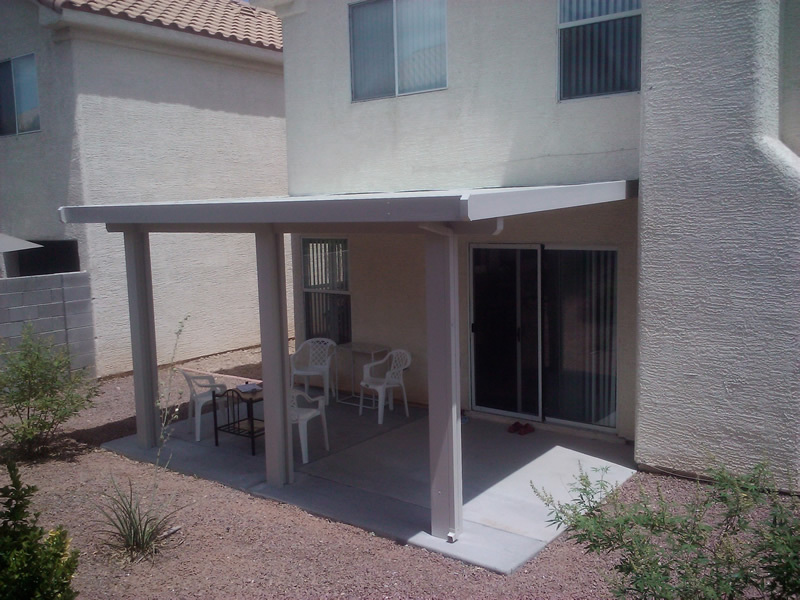 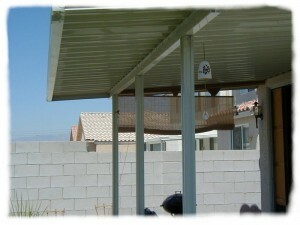 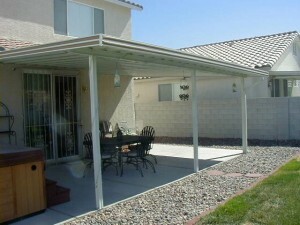 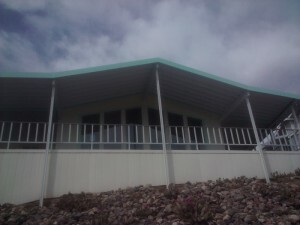 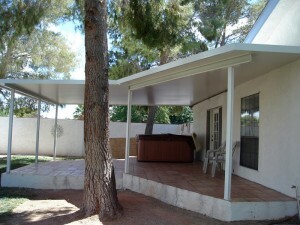 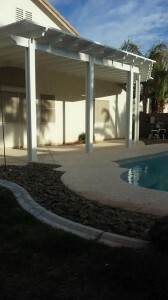 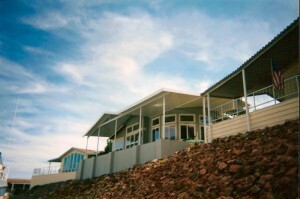 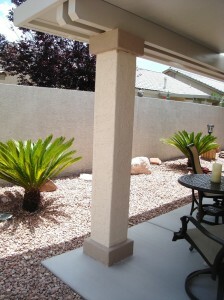 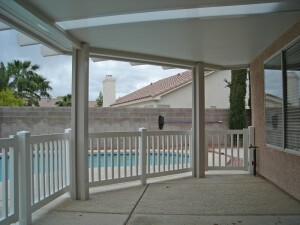 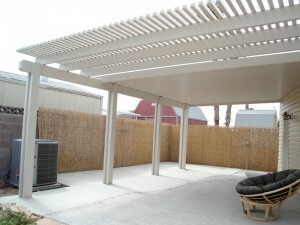 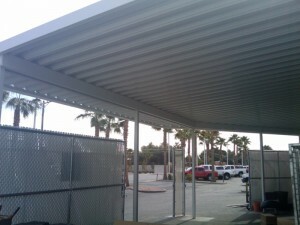 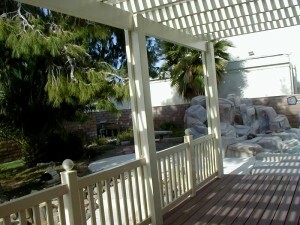 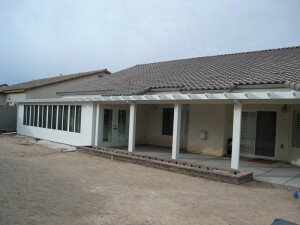 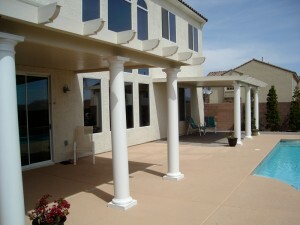 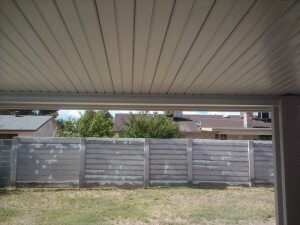 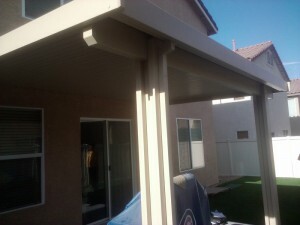 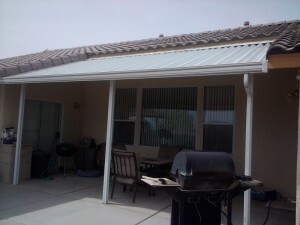 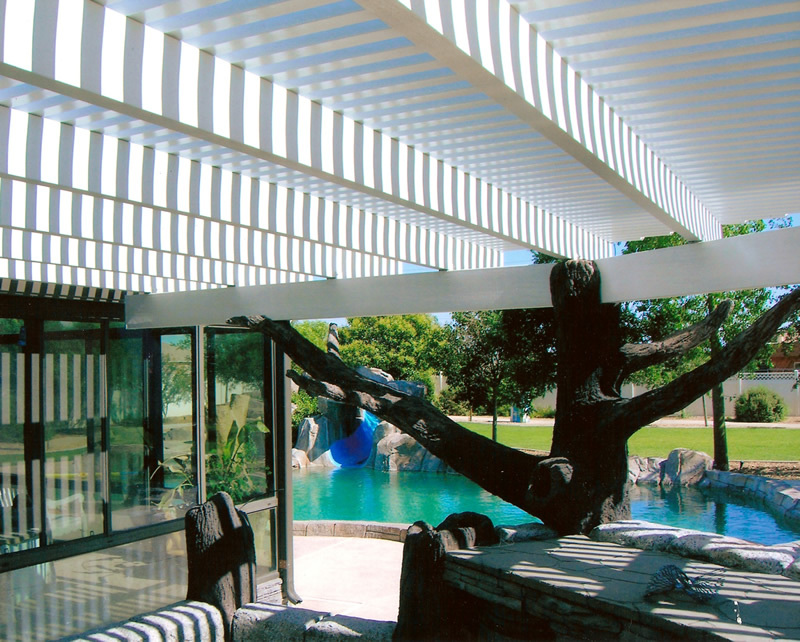 Please feel free to browse our different patio cover options to see some of our work, and what we can do for your home. Our Elitewood patio covers provide a unique alternative to using wood. 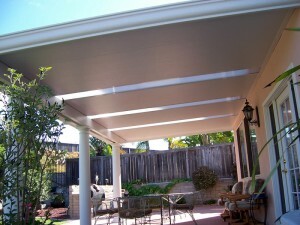 Our patio covers are manufactured using the highest grade non-recyclable aluminum products in the industry. 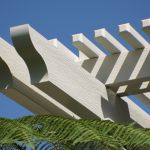 During the manufacturing process a pattern is embossed into the aluminum to give it the look and feel of real wood. 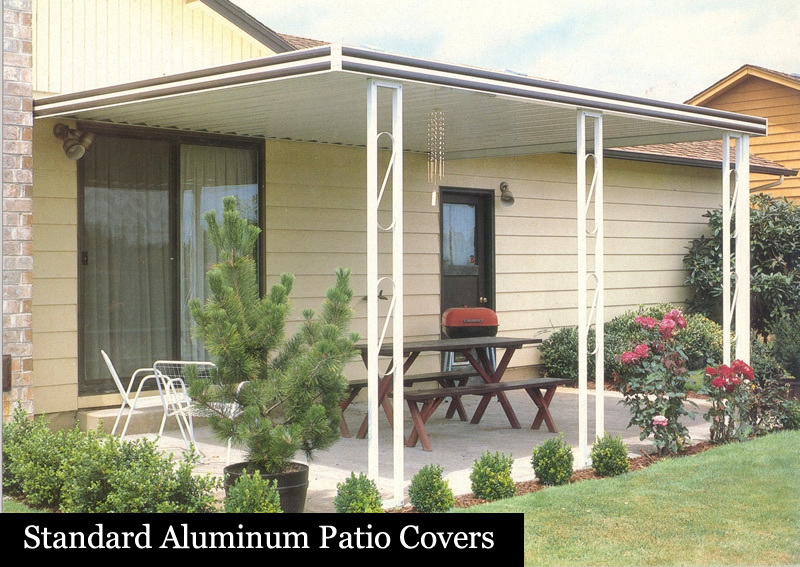 Guaranteed to never crack, warp, peel, rot, rust, burn, or attract termites. 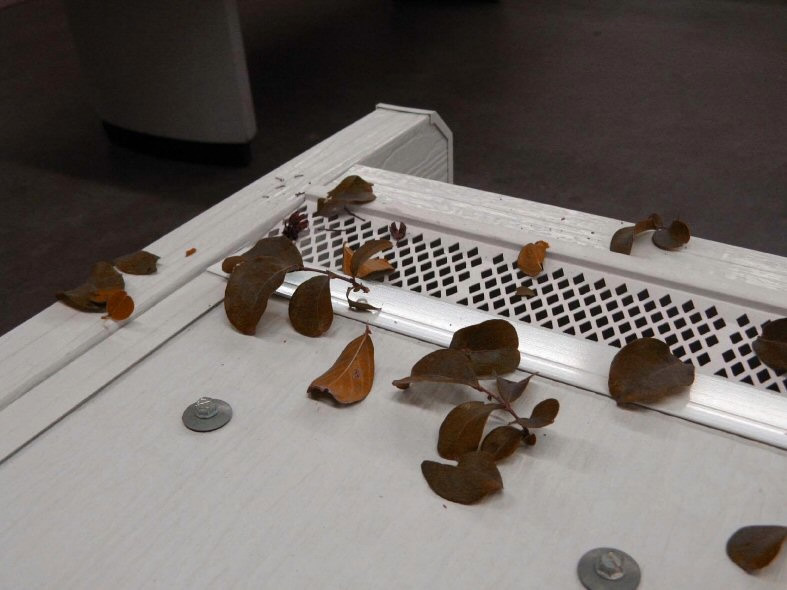 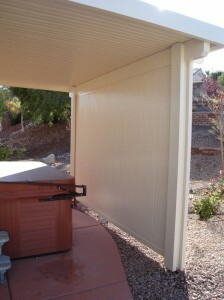 Our covers provide all the benefits of real wood without any maintenance. 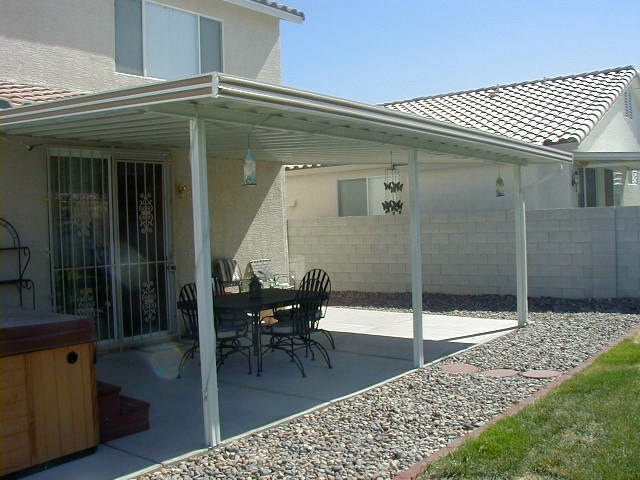 All our patio covers are maintenance free and backed by a lifetime warranty. You can bet that you will receive the best patio cover in the industry! 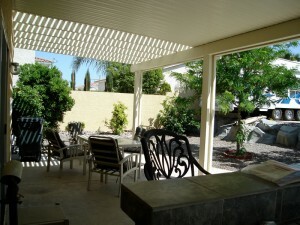 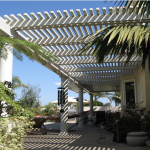 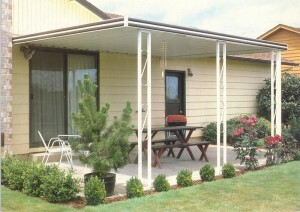 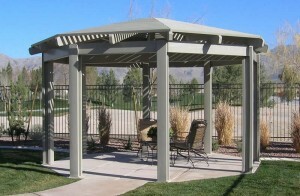 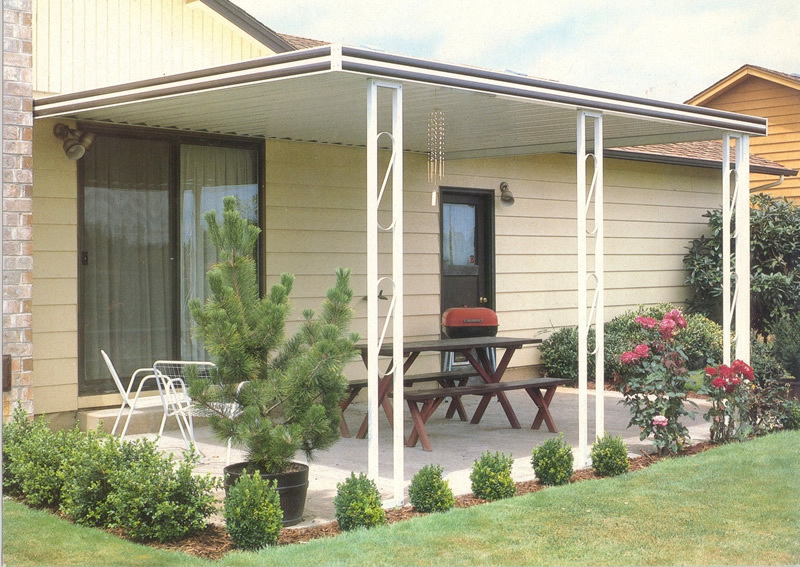 Our Open Lattice patio covers are extremely popular. These covers look excellent, and provide the shade that you need without blocking 100% of the sun. 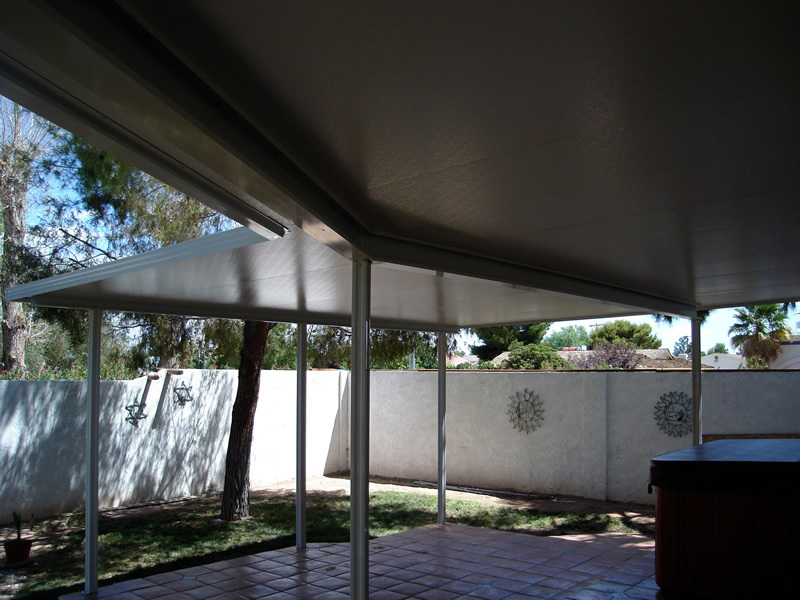 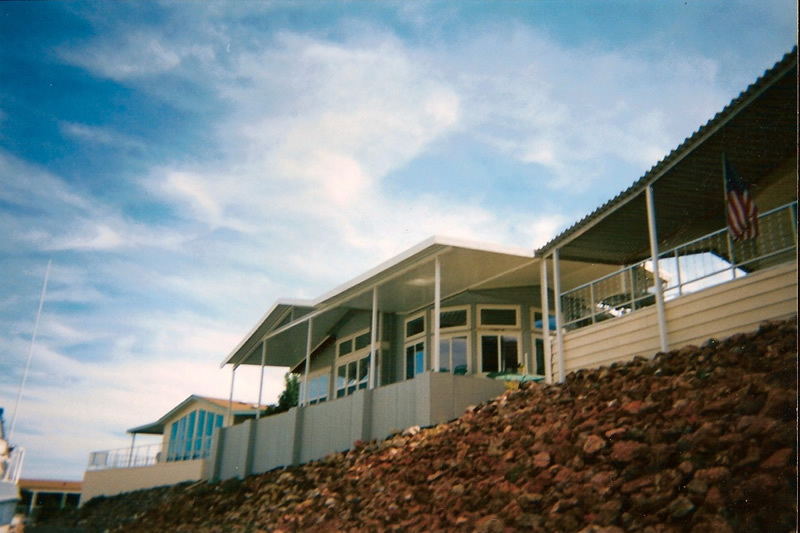 We also offer combination covers which feature a solid patio area that provides complete shade and protection from the weather. Meanwhile, the open lattice area allows some sun and warmth in. 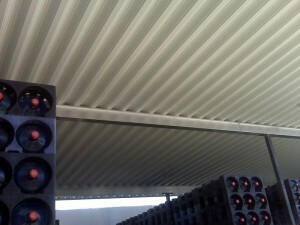 We offer several types of lattice tubes including 2" X 2" square tubes, 3"X 3" square tubes, and our 2" X 3" square tubes. 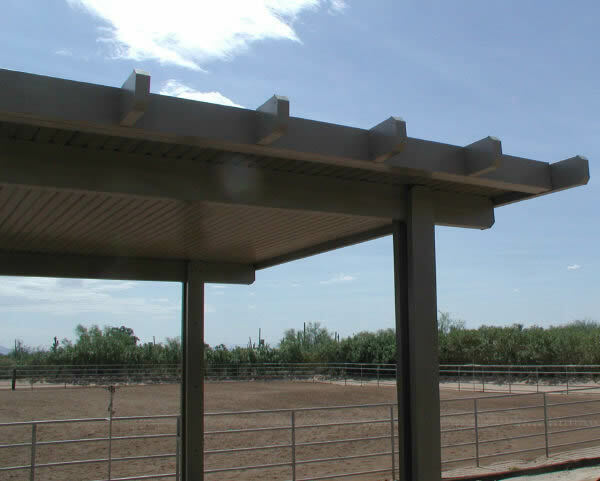 We can vary the spacing of these tubes to give you the most desirable shade percentage. 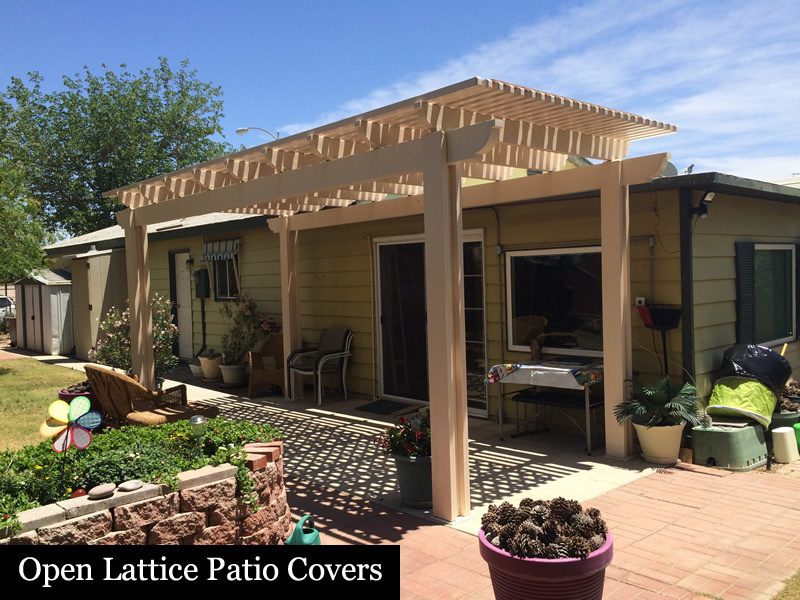 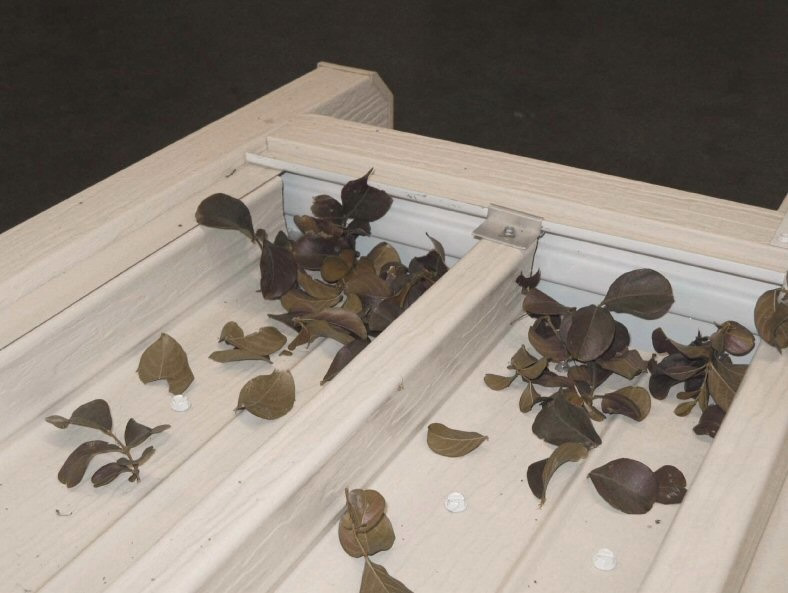 The finish on our lattice patio covers come with a baked on enamel paint system that also has a written lifetime warranty. 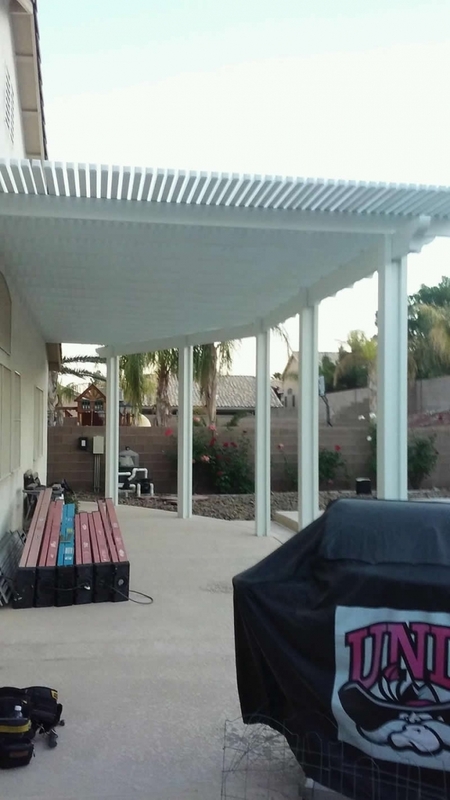 These patio covers will increase your property value, provide extra living space, and give you many years of protection and relief from the hot sun. Our standard patio covers come with a manufacturers written lifetime warranty. 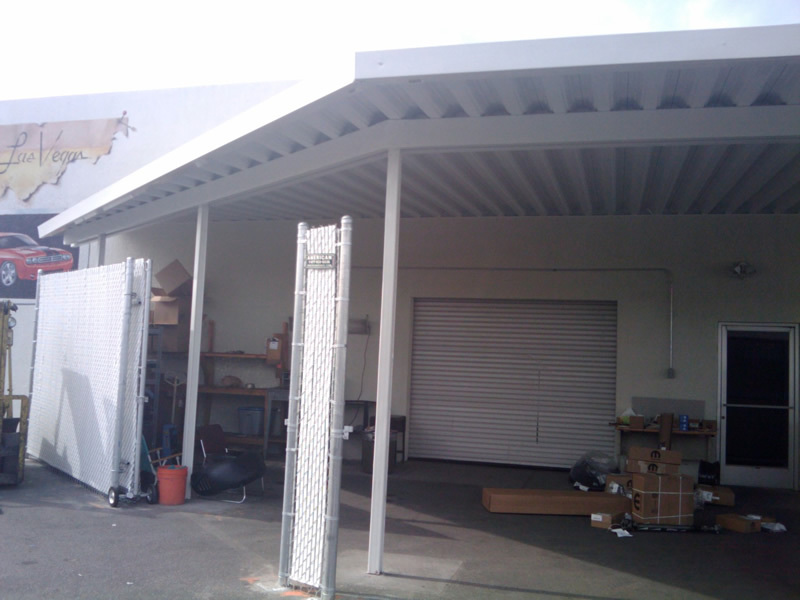 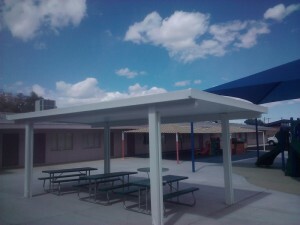 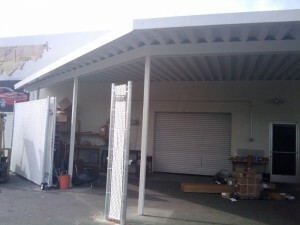 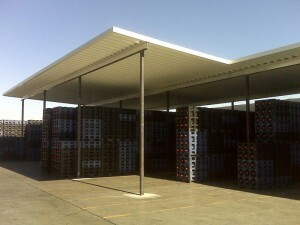 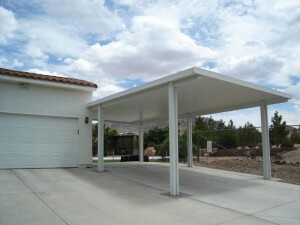 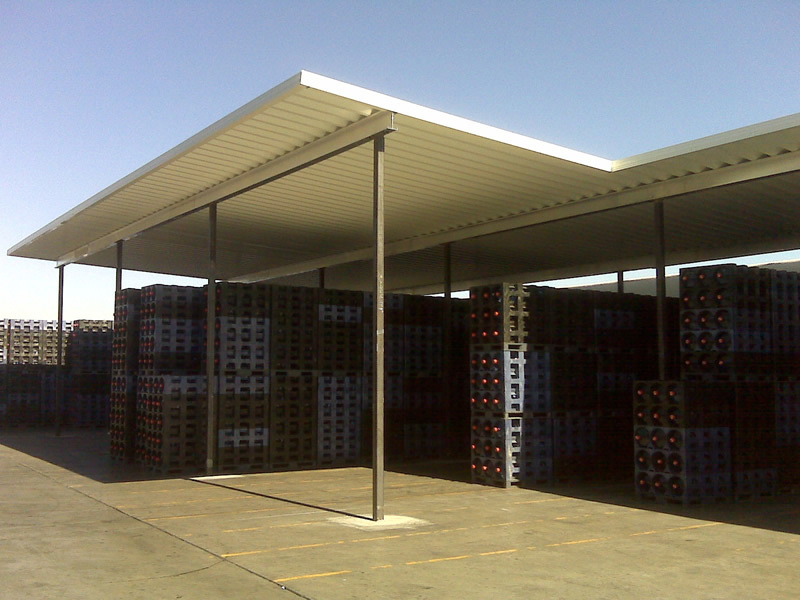 These maintenance free covers are a cost effective way to provide shade. 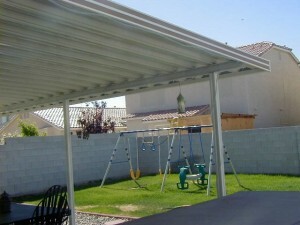 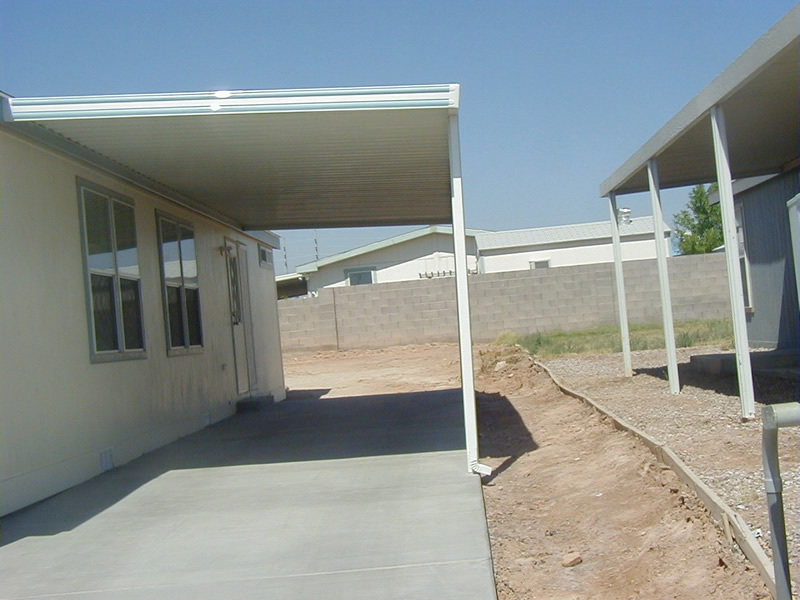 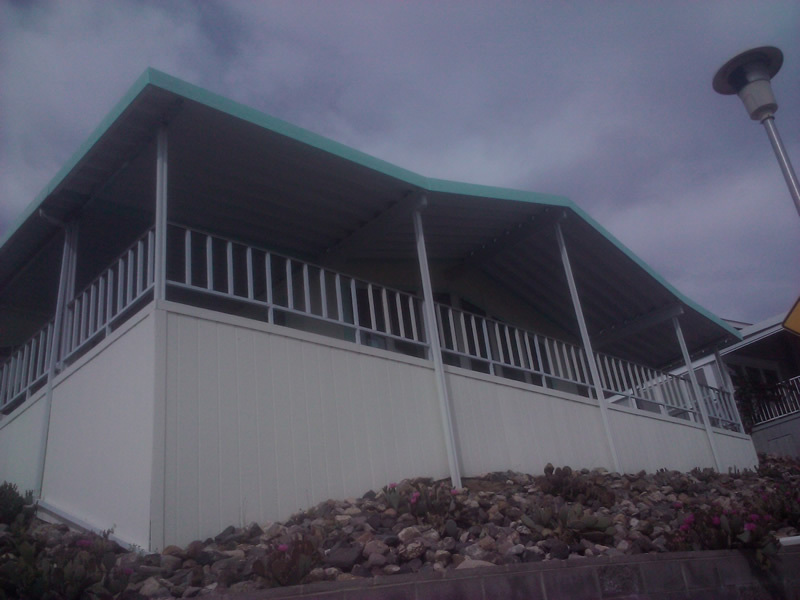 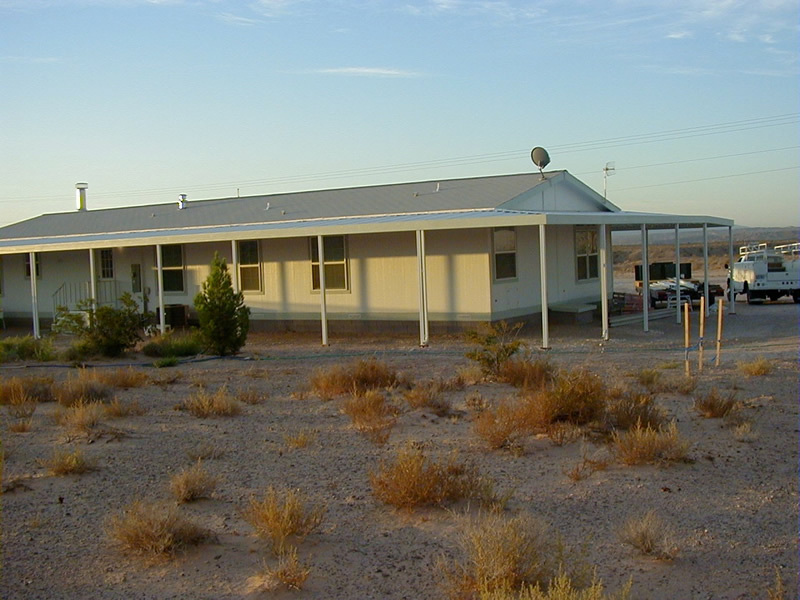 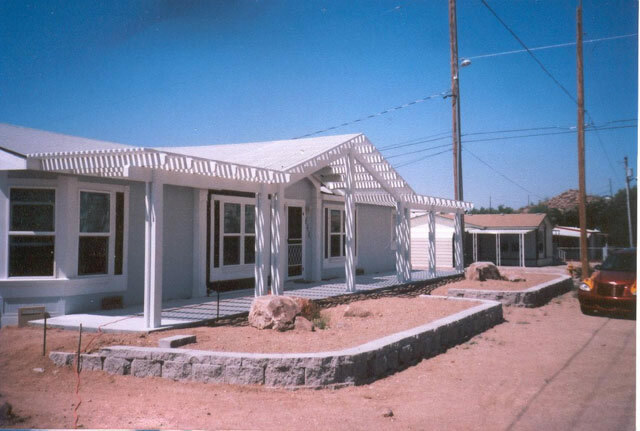 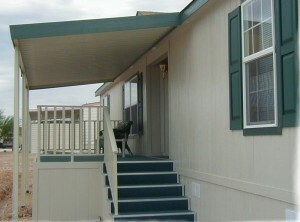 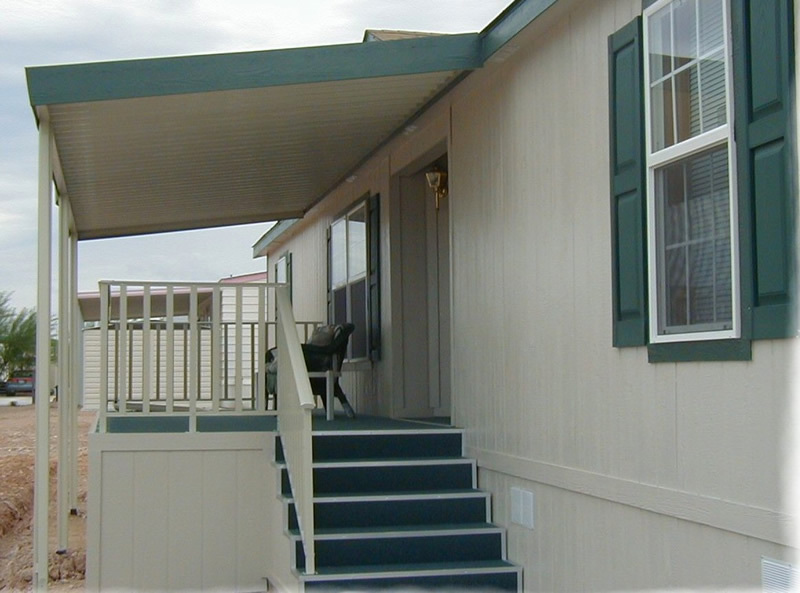 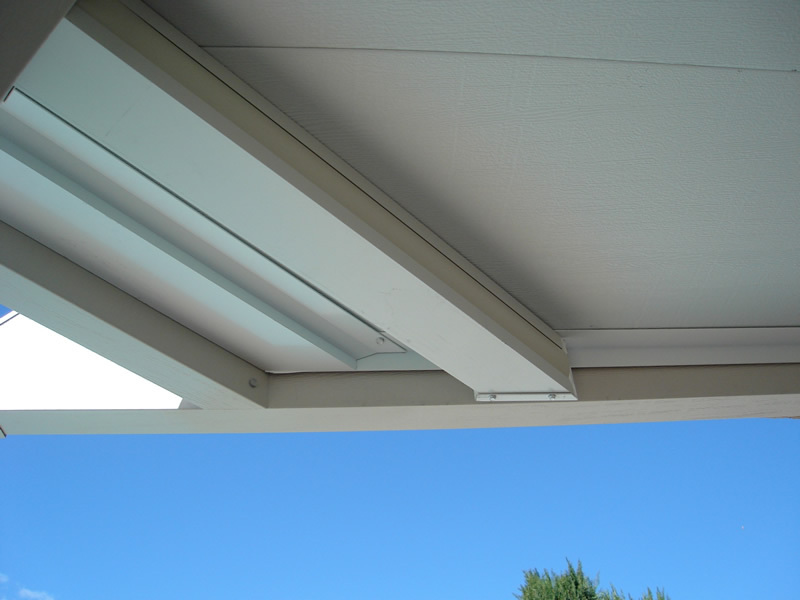 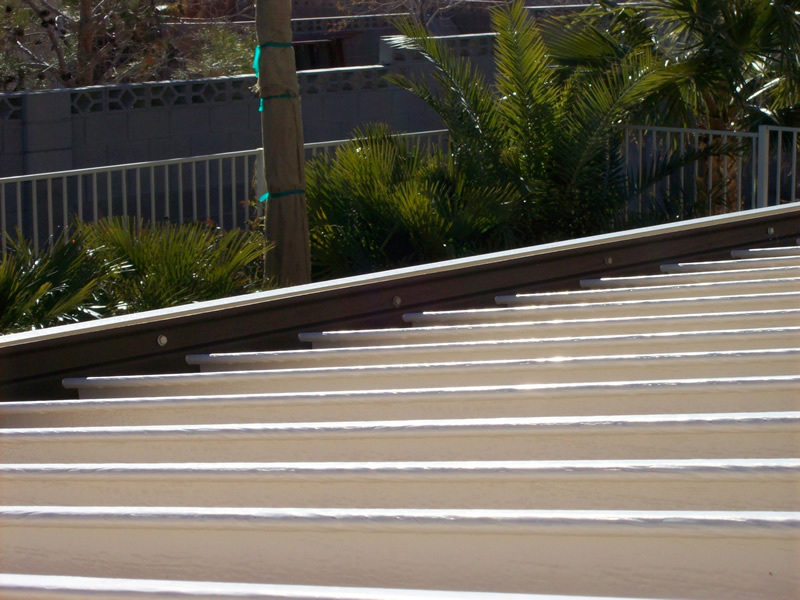 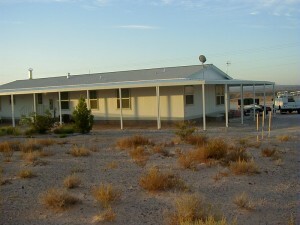 The covers will withstand 90 MPH winds, and come with a complete gutter system. 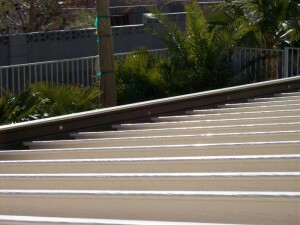 Elitewood™ Ultra Series is proud to introduce Kynar coatings. 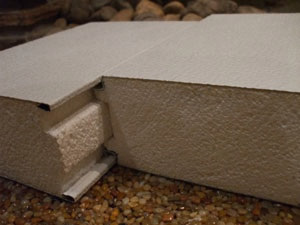 Kynar 500 is a unique coating used on the extrusions for the majority of high rise buildings, such as Mandalay Bay and the Rio. Kynar 500 resin-based coatings outperform polyester powder, urethane, silicone polyester and acrylic coatings in every category: better color retention; better gloss retention, better resistance to chalking. 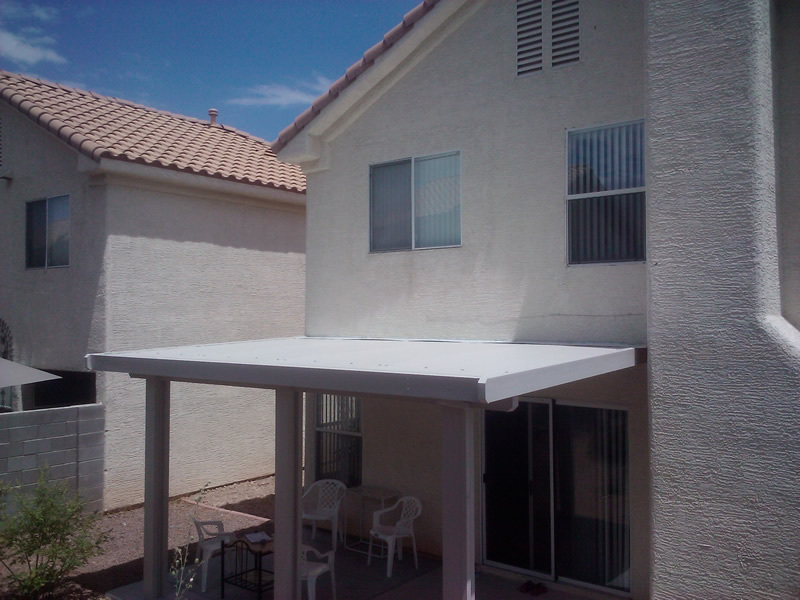 We guarantee no chalking or fading. 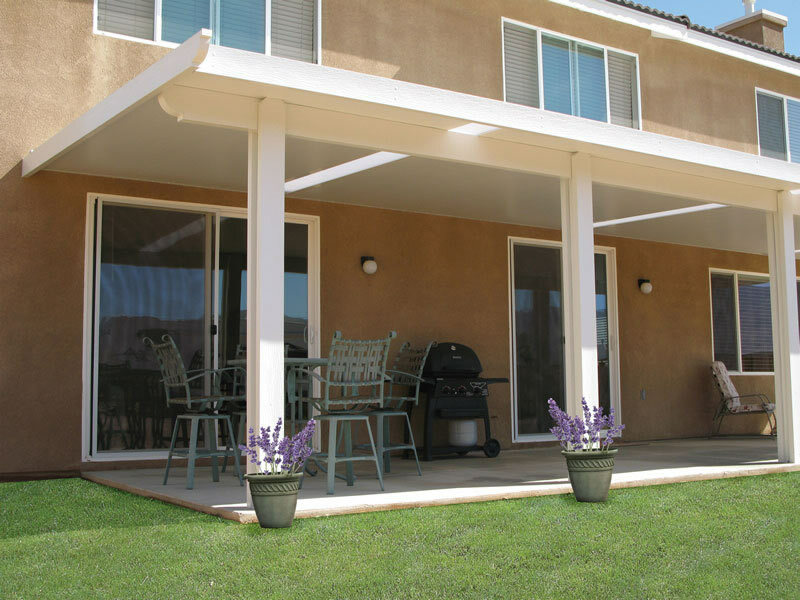 With Kynar 500, we offer the best warranty in the industry along with a 10-year labor warranty.